Welcome back to the LRTA! I gotta say, we’ve got a pretty good route here with the 7. Could this be the best route on the system? Maybe! We began, like all LRTA routes (well, except that which must not be named), at the Kennedy Center. From there, we meandered our way onto Thorndike Street, sailing through an underpass and over the Pawtucket Canal. Thorndike became Dutton, paralleling a canal with apartments and converted factories on the other side. 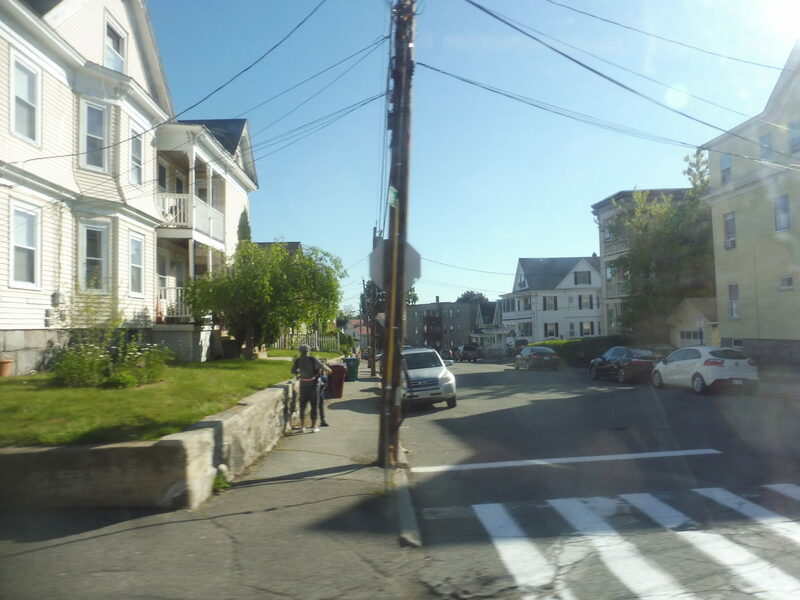 Once Dutton Street ended, we turned onto Merrimack Street, passing Lowell City Hall and a library. The main part of downtown Lowell was in the other direction, though, so this was mostly apartments with a few businesses here and there. There were more parking lots after we crossed a small canal, and the brick buildings became shingled triple-deckers. The street turned into University Ave when we went on a long bridge over the Merrimack River, and indeed, we were in UMass Lowell’s campus on the other side. While the campus heads north along the river, though, we stayed on University Ave, which quickly became residential. Lots of different houses and apartments. We very nearly entered Dracut, but we turned onto Old Meadow Road to stay in Lowell. The houses had more space between them now, although they slowly got dense again as we turned onto Mammoth Road, then Woodward Ave. The street got pretty narrow, and our next street, Brookside Street, was even more so. Varnum Ave was a main road, though, but before we could get very far, we had to deviate to Lowell General Hospital, which was up on a hill. A leafy view from the hospital road. 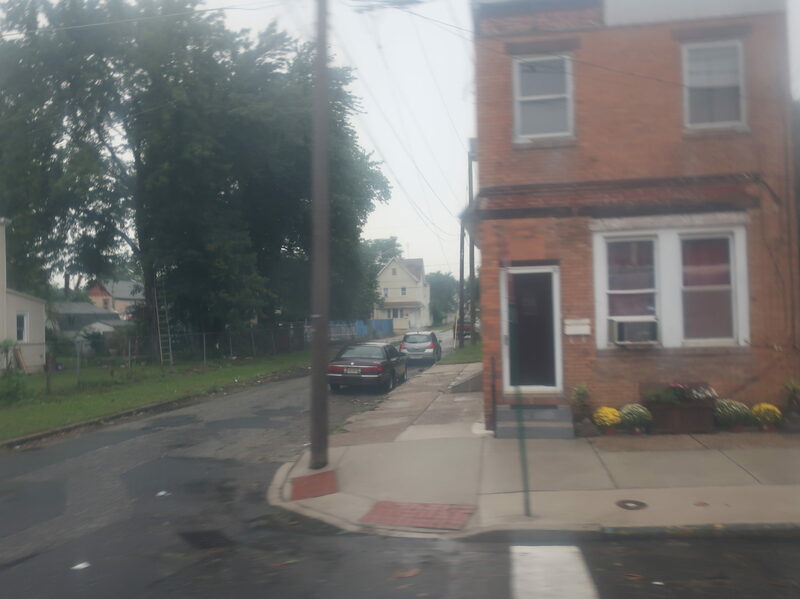 Back on Varnum Ave, it was lots and lots of suburban houses…plus a few small apartment developments here and there that probably drive most of the 7’s ridership at this point. 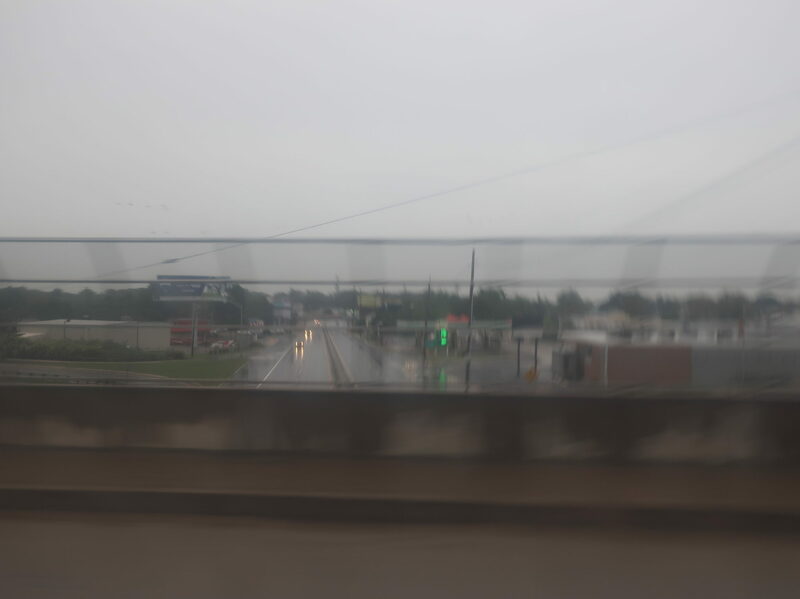 We passed a few businesses at the intersection with Totman Road and an nursing home a little later. A few bigger apartment developments and a farm showed up as we continued, but it was still mostly houses. At the very end of the route, we entered Tyngsborough and pulled over at the entrance to the Greater Lowell Technical High School. Oh, and a nearby house had chickens in its yard! This is such a lovely terminus that it needed two different angles. Ridership: The route commands a respectable 687 people per weekday, giving it the highest weekday ridership on the whole system. Saturday ridership is significantly lower at just 161 daily riders, but it is still the third-highest on the system. Pros: The 7 serves a huge part of Lowell all to itself, which I think contributes to its high ridership. It has a fantastic weekday schedule with half-hourly service all day, from 6 AM to 7:30 PM (plus an additional trip at 9 PM). 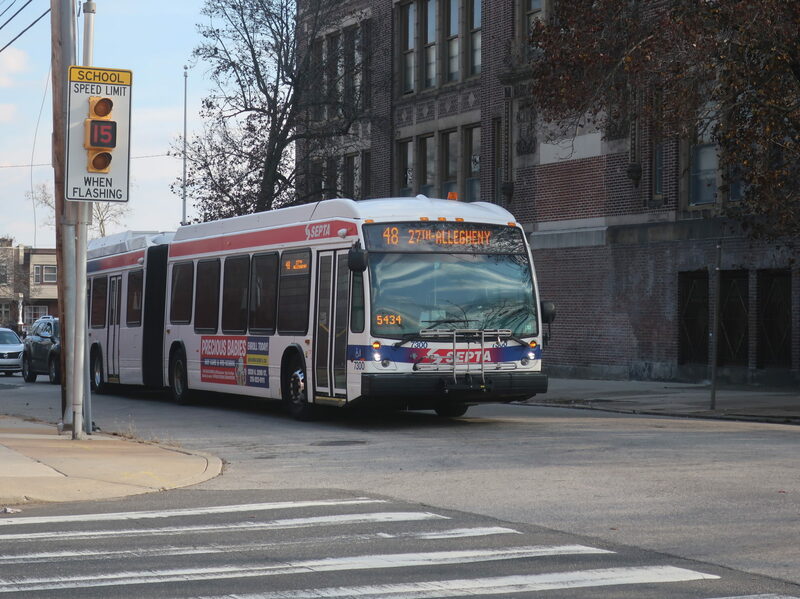 Saturday service drops to every hour, but that’s not horrible for an RTA, I guess. Finally, the route stays in Lowell for nearly the whole time, making it quite possibly the longest LRTA ride you can do while still paying the vastly cheaper “city” fare! Cons: No Sunday service is sad. I know none of LRTA has Sunday service, but this is one of their routes that would really benefit from it. Also, all LRTA maps show the route as deviating to other parts of UMass via Aiken Street, but Google Maps, the scheduled times, and, er, my ride show that this isn’t true. Please change your maps, LRTA! Nearby and Noteworthy: The Hawk Valley Farm looks like a great nature reserve, and it’s right along the route. I looked through all my old LRTA reviews to see how they all stack up. Apparently I’ve given this system a lot of 8s! Geez, Miles, the system isn’t that good. But yes, the 7 does well and truly deserve an 8. The inconsistent maps are annoying, and I feel wary about giving any route without Sunday service anything higher than an 8, but this is a great route otherwise. Best on the LRTA? It just might be! 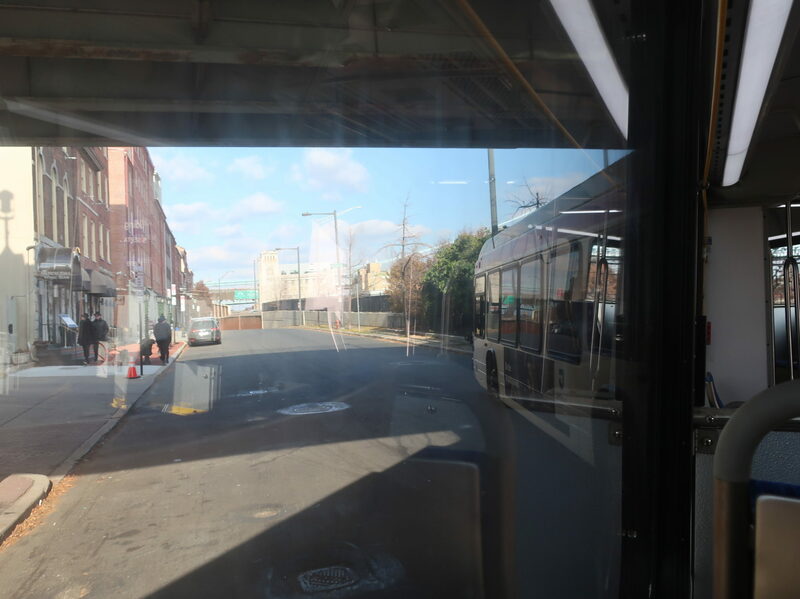 Since the 49 is opening in less than a week, I thought I’d take a look at one of the other routes that winds its way through Brewerytown and Fairmount. I’ve actually ridden both the 48 and the 7 in full, but since A) the 48 comes before the 7 in my backlog, and B) the 7 is a ridiculously long route and the post involves a story, I figured we’d push the 7 for another day. For now, let’s take a ride on the 48! Oooh, I love the way it’s snaking in! The fact that I rode on a Saturday at noon may affect my opinion on the route. 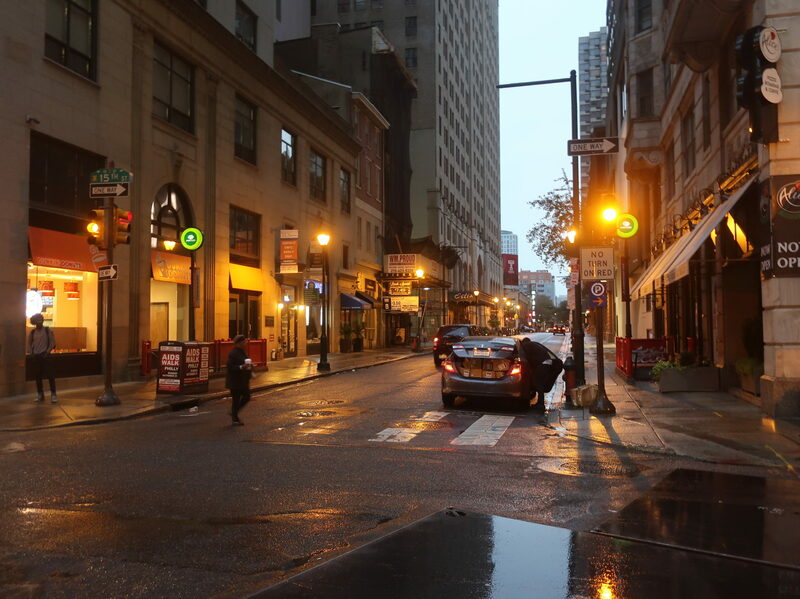 After all, the 48 goes across the entirety of Center City, from Front Street to 22nd Street. The traffic during rush hour must be unbearable! But on a Saturday midday, it wasn’t bad at all. Luckily, I’ve seen 48s at rush hour trapped in Center City traffic, so I know how slow the route can be. Might as well get our bus inception out of the way now! Another oddity of the 48 is that it starts at the Front-Market Loop (the only other route that begins there is the 5). 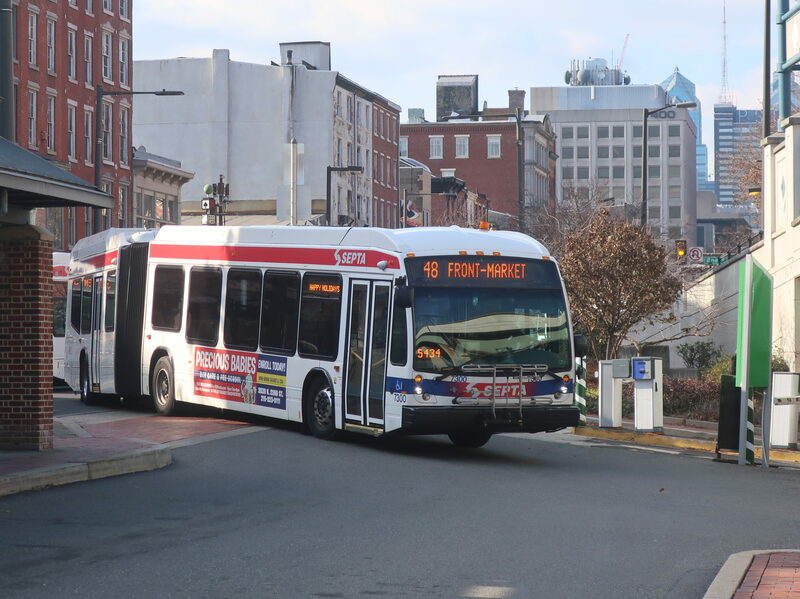 The other buses that travel across Center City begin at Penn’s Landing, but I guess for capacity reasons, the 48’s first stop is this loop just before the Penn’s Landing viaduct. The Penn’s Landing routes all just run down Market in both directions, but because the 48 starts where it does (and because SEPTA can’t establish any routing consistency anywhere), it uses Market in the eastbound direction and Arch in the westbound – the only route to travel down Arch across Center City. We went up Front Street, a ridiculously narrow road squashed between apartments and the I-95 viaduct. Luckily, Arch Street was a somewhat normal-sized street (for Philly, at least), lined with apartments and fancy Old City businesses. 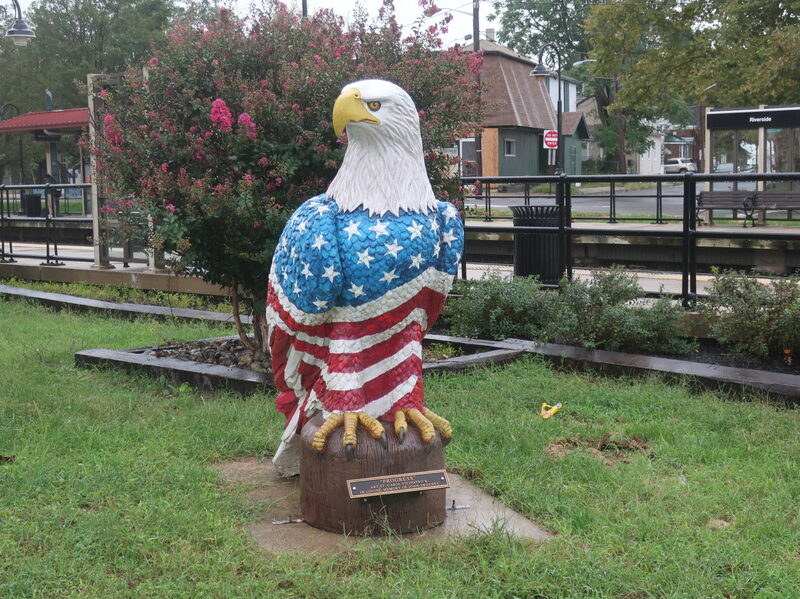 There were also plenty of historical attractions, including the Betsy Ross House, the US Mint, and Independence Mall. 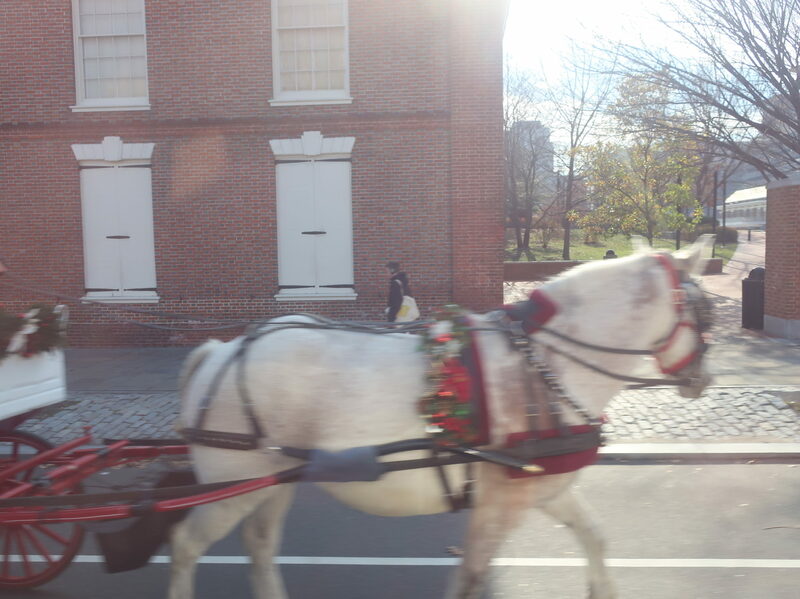 Welcome to Philly’s tourist trap- er, historical green. 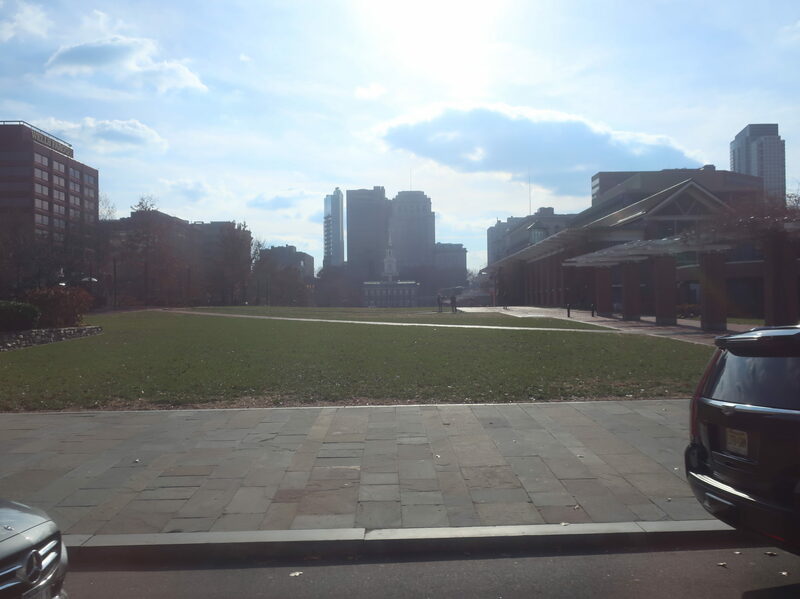 The African American Museum was the last museum in the clump of them around Independence Mall. A few blocks later, we entered Chinatown, going straight by the arch (which was on the wrong side for me to get a picture, alas). That ended after a few more blocks, then one side of the street was occupied by the gigantic Philadelphia Convention Center, while we passed Reading Terminal Market on the other side. 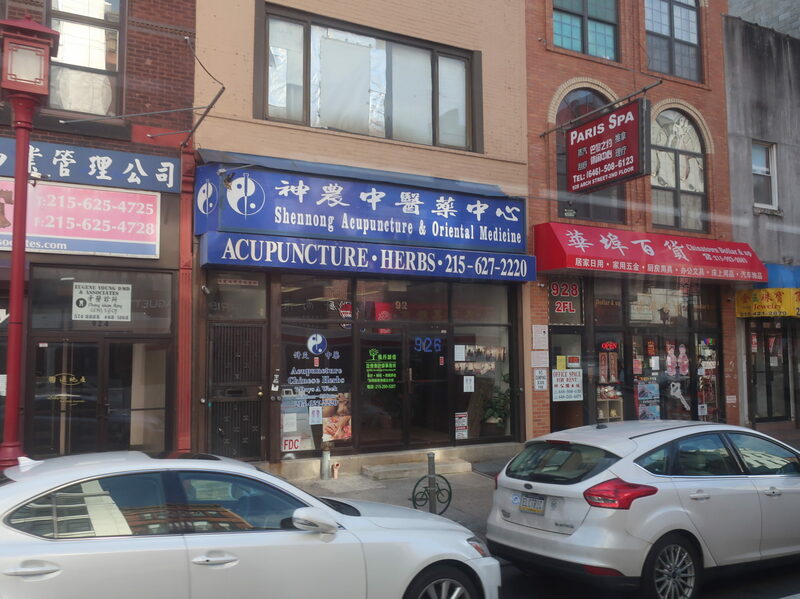 Some of the businesses of Chinatown. We got a great view of City Hall crossing Broad Street, then we saw Love Park right after (still hosting the Christmas Village when I rode). It was skyscraper time from there, including the Comcast Center, the tallest building in Philly. Soon, though, the street got residential as the Regional Rail came out of its tunnel a half-block south. We took a right onto 22nd Street, finally beginning our trek north. Christmas Village! And a ton of tall buildings. 22nd Street was all apartments, but unlike in Old City, these were definitely built in the 20th Century. 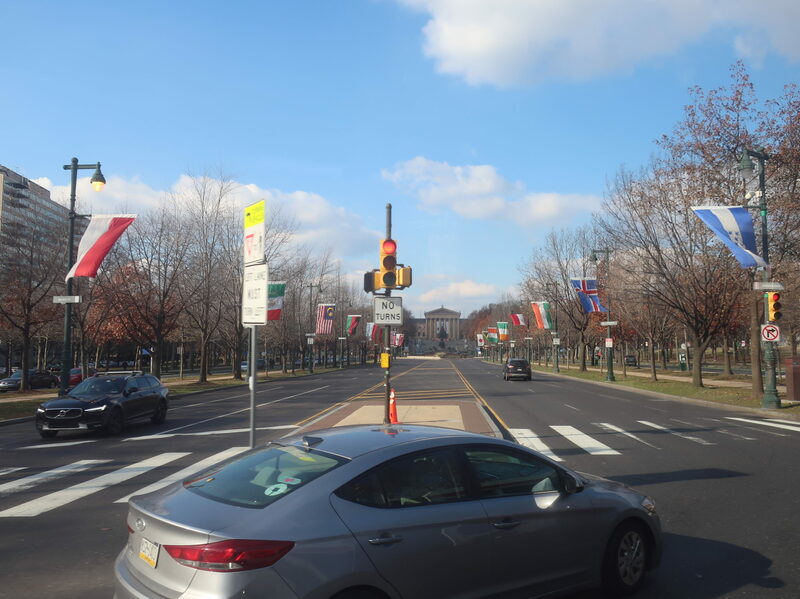 After going over the Vine Street Expressway, we crossed the good ol’ basically-a-highway Ben Franklin Parkway, with a fleeting view of the art museum (and the Rodin Museum right along 22nd). 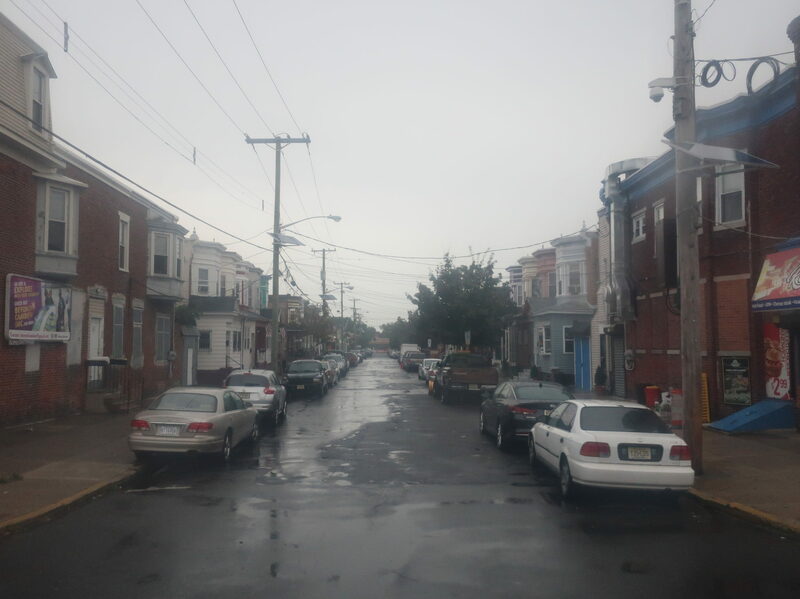 We officially entered the Fairmount neighborhood after the intersection with Spring Garden Street. I suppose this is obligatory. This was a really nice neighborhood – lots of rowhouses, but also one-off small businesses that mingled in with the apartments. 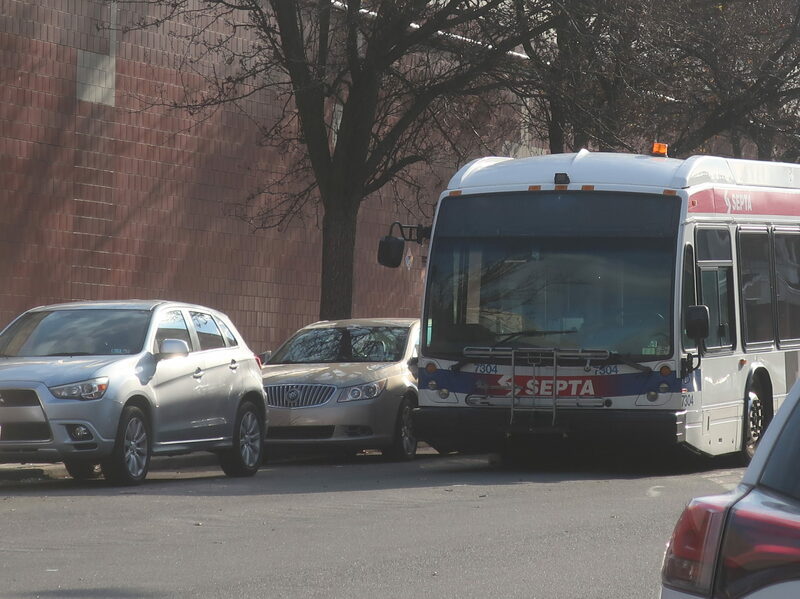 The bus got to do a fun maneuver at Fairmount Ave, where 22nd Street has to make its way around the Eastern State Penitentiary. Some tight turns ensued, then we took a left onto Aspen Street outside of a parking lot. Aspen was a street that was far narrower than any street with a bus route on it should conceivably be, but it did pass some charming businesses at each corner, with the ever-present rowhouses in between. 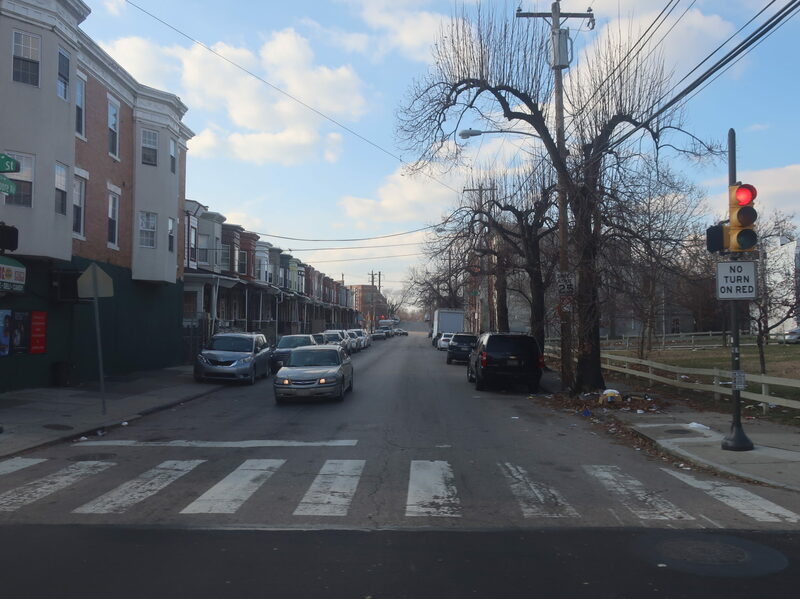 We turned onto 27th Street once we reached the edge of Fairmount Park. Let me just preview a rant that will come later by saying that all three (soon to be four) buses that serve western Fairmount take slightly different routes, but not the exact same routes. Thus, it’s noteworthy that all three of them share this part of the one-way 27th, if only for a few blocks! But…oh wait, the 49 won’t serve it. Of course it won’t. 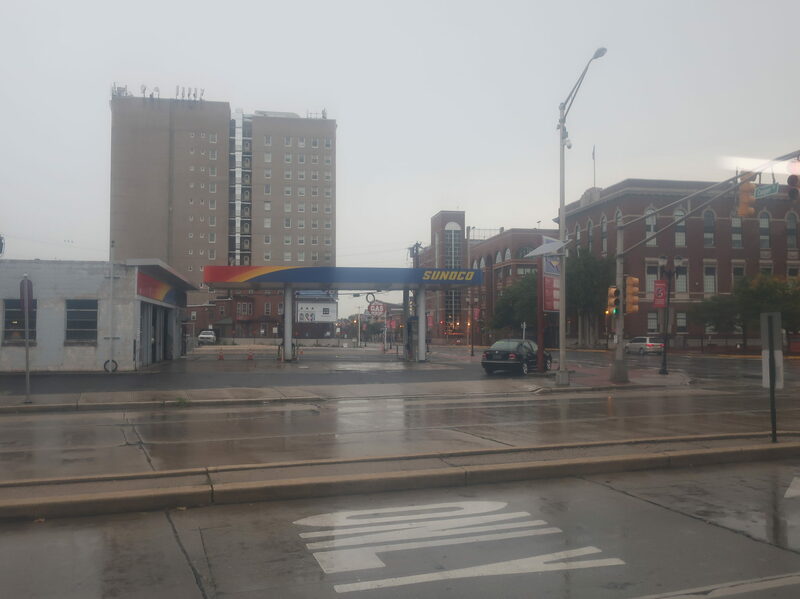 After a left onto Poplar Street and a right onto 29th Street, the craziness was over: the northbound and southbound routings of the 48 were together at last, and we would make no more turns until the end. Wonderful. 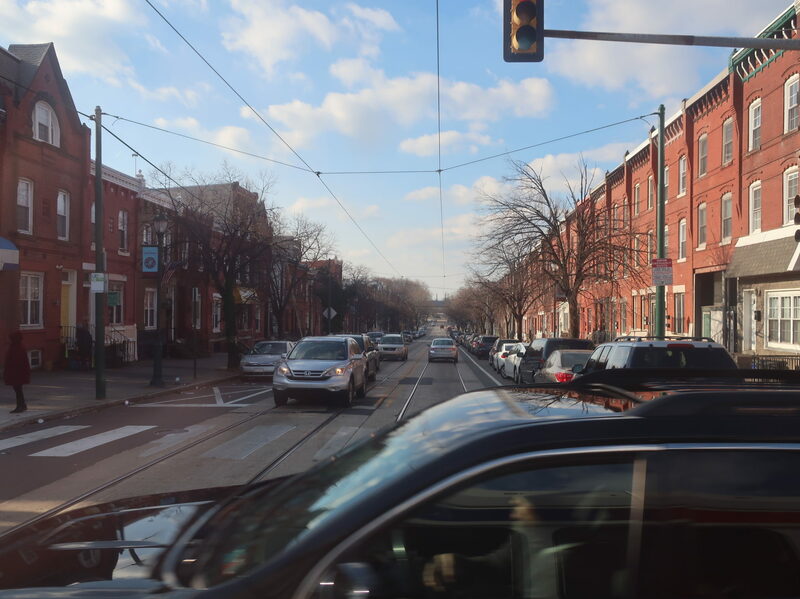 We crossed Girard Ave (and the 15 trolley), leaving Fairmount and entering Brewerytown. The primarily residential 29th Street definitely had a rougher edge to it than before. 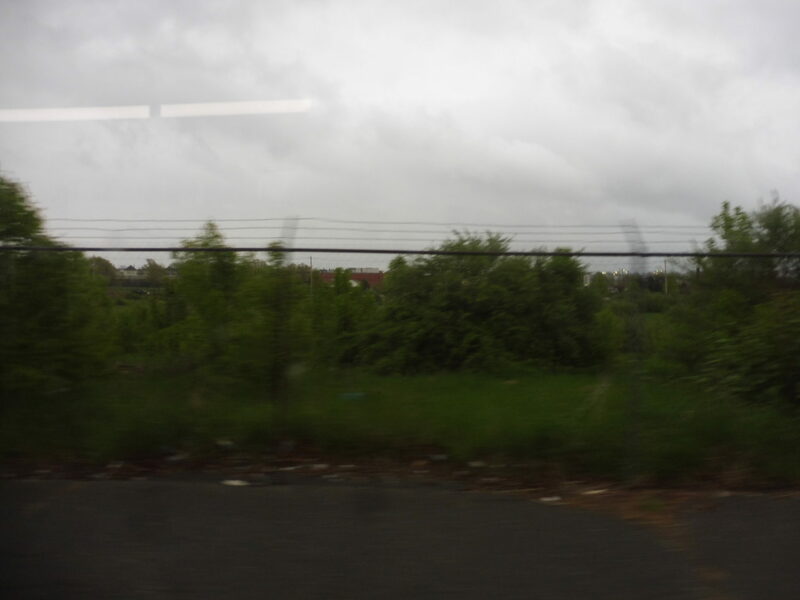 Crossing Cecil B. Moore Ave.
Once we crossed the Northeast Corridor, we entered Strawberry Mansion, where there were a lot more abandoned buildings and patches of vacant land. We passed a few businesses, mostly grocery stores and shuttered restaurants, as well as a few churches, but it was mostly apartments in varying states of decay. Also, the 7 left us at Susquehanna Ave, and we would be on our own for the remainder of the trip. Hmm…it might be wise to choose a different daycare. 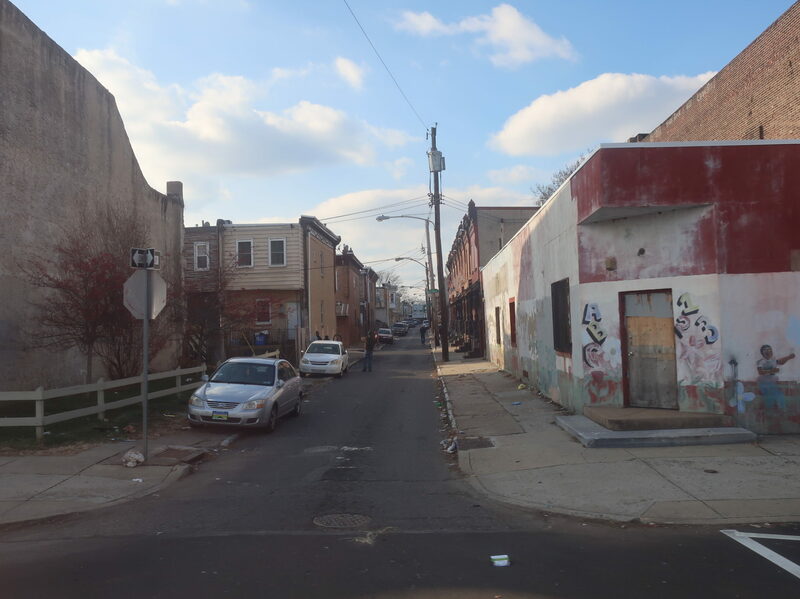 A park broke up the blocks of rowhouses, and along with it came a Philadelphia Water Department office and a middle school. A few blocks after the apartments came back, we turned onto Allegheny Ave. The route ends with a loop around SEPTA’s Allegheny Depot via 26th, Clearfield, and 27th; I got off at Clearfield and 27th, so it would look like I was actually going somewhere. From there, the bus proceeded to its layover point, where there’s no actual space for laying over, so you just get multiple articulated buses blocking a ton of parked cars from leaving their spaces. Nice. About to turn onto 27th. Just wanted to showcase how awful this layover is. Ridership: Given the route’s frequency, I would’ve thought its ridership would be higher, but it’s nothing spectacular: 7,630 people per day. Oh, don’t get me wrong, that’s great ridership, but it ranks 33rd for SEPTA routes, and plenty of busier buses get worse service. Pros: I appreciate how once the route gets onto 29th Street, it’s a straight shot up to Allegheny – talk about a good strong corridor. And the frequency on the 48 really is impressive, with possibly one of the best schedules on all of SEPTA: every 6-8 minutes at rush hour (with similar productivity to midday, to boot! ), every 12 minutes during the day, every 10 minutes on Saturdays, and every 15 minutes on Sundays. 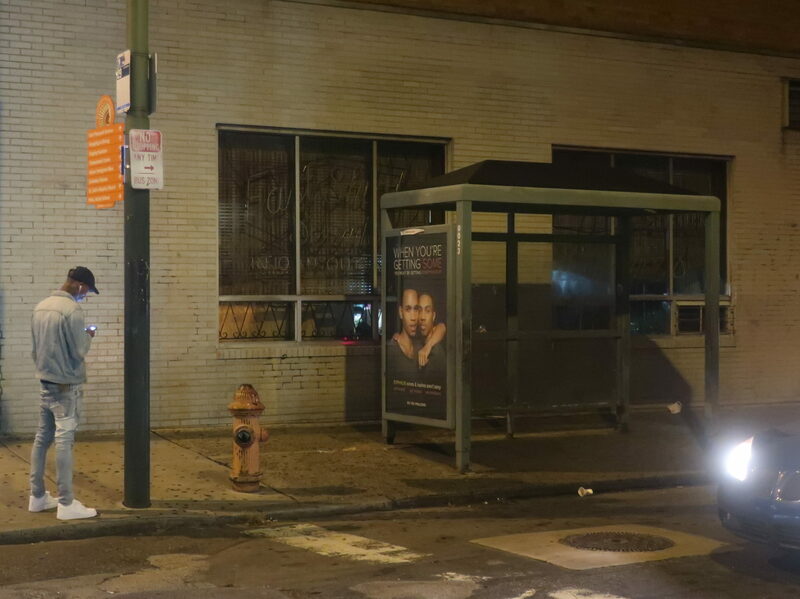 The route does become every half hour at night (service runs until almost 2 AM), but it’s at least every 20 minutes until 10 PM seven days a week, which is really quite good for SEPTA. Also, the 48 has just one variant! Every trip does the exact same thing! I love it! Cons: Oof, that layover. How can they get away with blocking cars like that? 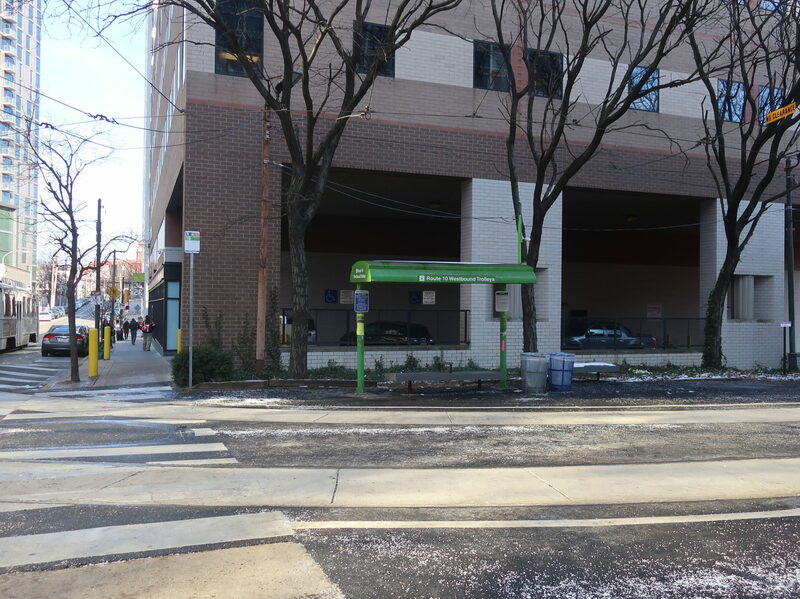 I know it’s right next to a SEPTA garage, but it seems like anyone can park there. I guess a word of advice is…don’t. The 48’s routing through Fairmount is, of course, very annoying, especially when every other bus through the neighborhood goes its own way. Also, running down Arch Street is a little strange, considering no other route does it (plus the 48 takes Market like normal in the other direction), but I get more why it has to do that – space in Center City is limited, so starting at Front and Market makes some sense. Finally, I think this route might be under-capacity. I mean, the route’s load chart shows that vehicles never get above 45-ish people on board at once. And it uses articulated buses! 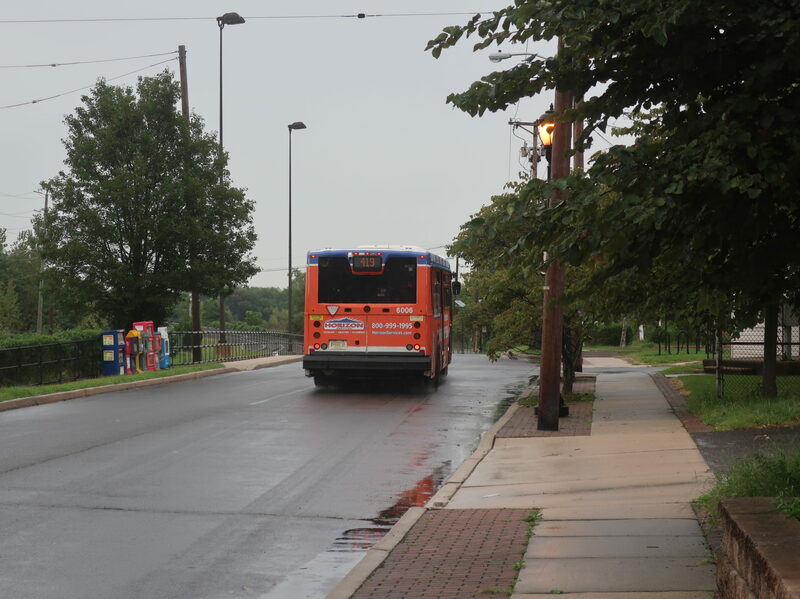 Granted, there aren’t any other routes out of Allegheny Depot that need them more than the 48, but it really would be nice to see these buses go to routes that regularly get packed. Assuming these charts are accurate, regular 40-foot buses can easily handle the 48’s loads. Nearby and Noteworthy: This is a great way of getting to the Eastern State Penitentiary from Center City. I’ve yet to visit, but I’ve heard it’s awesome! Also, Fairmount in general seems like a great place to just walk around. Oh, also walking. Did I mention walking? There’s a lot of walking. The River LINE’s half-hourly headways are really good considering it’s basically a commuter rail service. But waiting in Riverside, NJ for half an hour on an early Sunday morning? Lemme tell ya, there’s not a lot to do. Yup…this is all there is to it. I get the feeling most River LINE reviews will be like this. There’s just not a lot here! 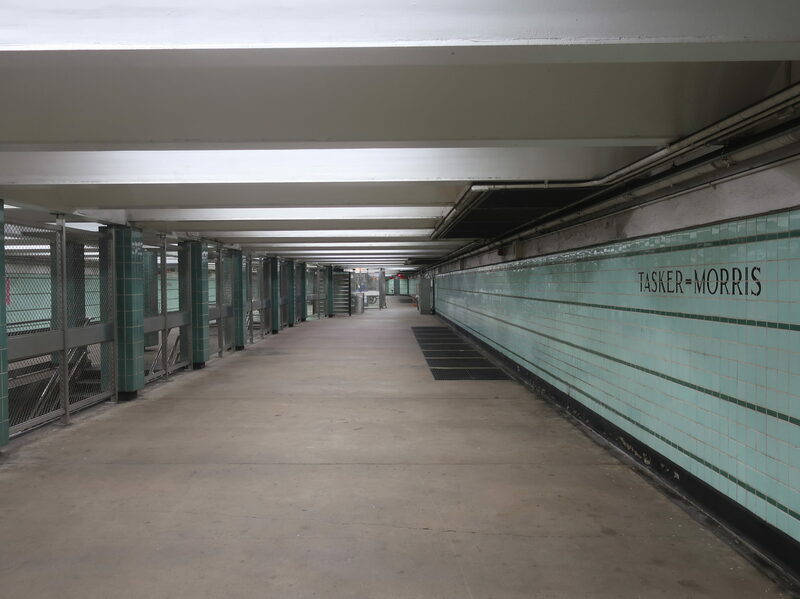 The high-level platforms get ramps on both sides, and once you’re up there, you’ve got all your basic amenities: shelter, benches, wastebaskets, ticket machines, and departure screens. For the record, that’s not a bad thing – the platforms are simple but effective. There are even a few little art pieces on the shelter columns, adding a tiny touch of character. 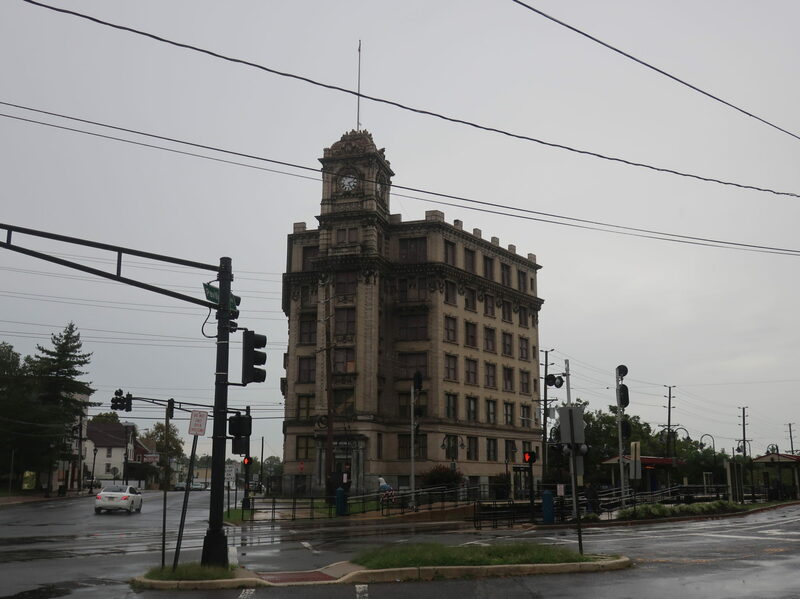 The sad-looking Watch Case Company building overlooking the station. “Lot 1”, the one in the middle that’s closest to the station, seems to get the most people. This is the one with actual NJT signs, and it also gets three bike racks. 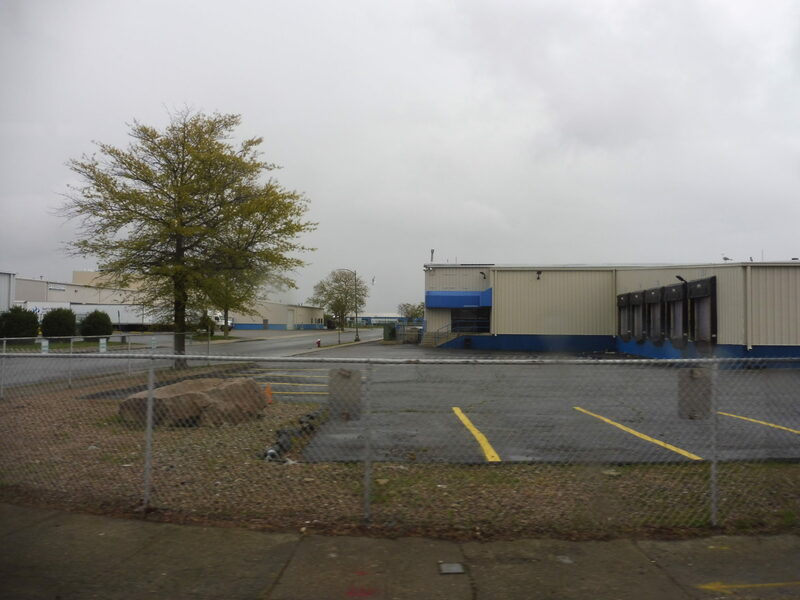 Lot 2, the smallest one, is across Pavilion Ave from the station. Finally, Lot 3, despite being the biggest, is really out of the way! I’m glad the road to it has a sidewalk, but it passes vacant land that was supposed to be occupied by a housing development that seems to have never been built. All together, the station has 315 (!) parking spaces, and they are ALL FREE. Not only that, but as far as I can tell, you can park in them for as long as you want. Man, what a deal! A train coming in with the old Riverside station in the background. Ridership: No ridership data, huh? Well, on an early Sunday morning, there were three to four people waiting on each side. Hey, better than nothing! Pros: The station does a lot with a little. I guess this is probably the case with most River LINE stations, but it has all the amenities you would want from a small-town stop like this. The station is right in the center of Riverside, but it also has more parking than you would ever need (not to mention it’s all free). Cons: I think lack of signage to the lots is the main thing. I guess the idea is that you’ve already parked your car, so you should know where it is relative to the station, but the fact that there are three different lots makes things more confusing. Proper labelling and signage would help wayfinding here a lot. Nearby and Noteworthy: There’s a main street. Was there anything to do on a Sunday morning? Uhh…the supermarket was open. Nice. Riverside is a station I don’t have a lot to say about, but that’s just because it gets the job done. Really, aside from the lack of signage, everything here is pretty good. And even if you can’t get to your car because you can’t find the lot, at least you’ll never get charged because parking is free and unlimited! Yay! Anything to get people to ride this thing, right, NJT? We are finally done with this system! I have been continuously reviewing SRTA routes since…geez, since August???? Okay, I did not realize it’s been that long. Basically, ever since I transitioned to Miles in Transit, every “MBTA” bus review has just been the darn SRTA! Well, let me stop talking and let’s get this final route, the NB 5, over with. Laying over at Stop & Shop. abandoned field of sorrow and despair. There were a few businesses when we reached an actual park and turned onto Rivet Street. Looks like a lovely place to bring the kids. It was all houses for a bit before we crossed the NB 1 at County Street. From there, we made a left onto 2nd Street and a right onto Potomska Street, which curved left to become MacArthur Drive. There was nothing much to see here other than a bunch of ocean-based industry (i.e. boats and fish) and a Price Rite supermarket that felt pretty out of place. One of the many warehouses out here. 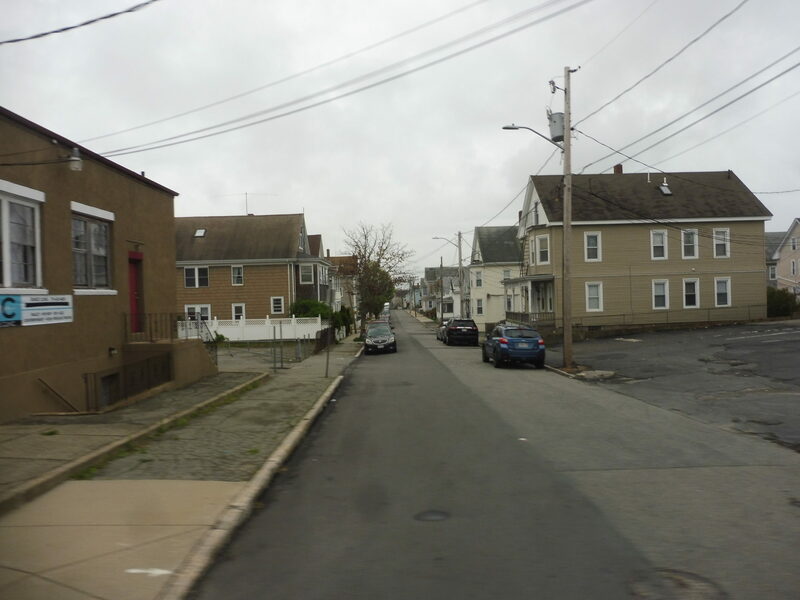 We went by more industry and parking lots, including a big power plant, then we turned onto Walnut Street then 2nd Street, heading into downtown New Bedford. Wait…why are we turning left? No, no, no, we’re so close, don’t do this deviation to me! Sigh…we had to do a loopy-loop to serve some apartments that are already served directly by the 1. Great. Can we go downtown now? The 5 travels via Union Street for some reason, which no other SRTA bus does, although Union Street runs through the really nice part of downtown with cobblestoned streets. That was pleasant, I guess. But I was so happy when we turned onto Pleasant Street and travelled up to the terminal. It’s too bad I never got to check this neighborhood out. Next time, I guess. Ridership: Bear in mind that the New Bedford routes tend to get overall higher ridership than Fall River routes (barring the North End Shuttle, as usual). Well, besides the North End Shuttle, the 5 is the least-used bus route on the entire SRTA. Yes, just about 129 riders per day were using this thing in 2014. The route also has the fewest passengers per revenue hour, 11.18, on the system, aside from the North End Shuttle (of course). Pros: Honestly, the best thing I can say about the 5 is that it serves that Price Rite in the industrial area. That’s kinda the one unique thing it does. Cons: The 5 is very much in the shadow of other routes. Aside from the industrial part (which I’m sure attracts very little ridership throughout the day barring the Price Rite), the 5 is never further than a 5-minute walk away from another bus route. I guess it kinda has a crosstown thing going on with its Rivet Street section, but the route’s alignment isn’t really filling any huge gaps in the system. Also, with service every 45 minutes on weekdays and every 60-65 minutes (inconsistent headways) on Saturdays, it’s even less useful as a crosstown. Oh, and there’s that stupid deviation that’s entirely redundant to the 1! Look, the 1 is every 20 minutes, this is every 45. I mean, come on. 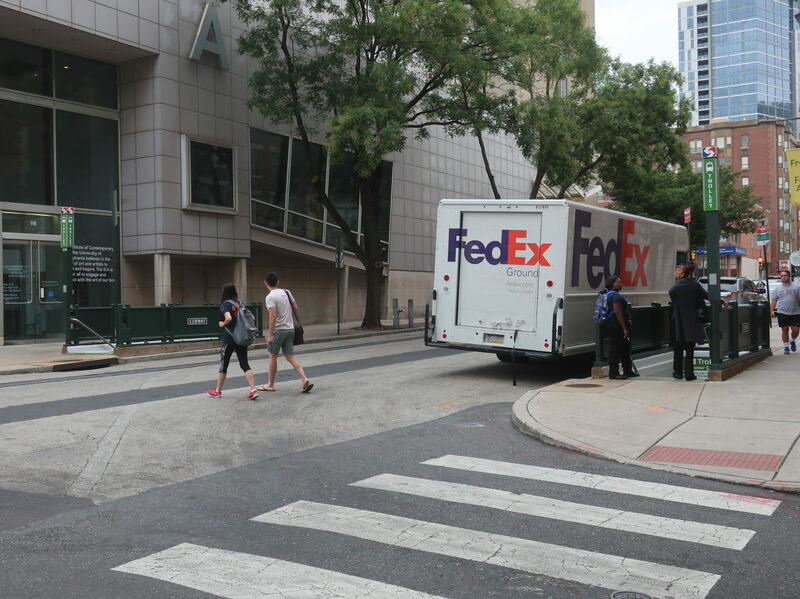 Yes, the 5 serves Price Rite, but if infrastructure was installed to let pedestrians cross the JFK Memorial Highway, walking from the 1 wouldn’t be a problem. Nearby and Noteworthy: Hey, it does serve that nice part of New Bedford! But also, you can just walk there from the terminal in a few minutes, so once again, this route isn’t really doing anything new. It may not be the most infuriating route on the SRTA, but it is one of the most useless. There are clearly some people using it, but I’d be curious to see how many of them could almost just as easily use a different route. I’ll bet it’s a lot. For the record, the SRTA was an overall decent system; we’ve just ended on a few bad routes, I guess. Sorry, SRTA. Totally out of nowhere, the MBTA has released its proposals for the bus network in the first phase of the Better Bus Project. These changes are meant to be easy targets that are cost-neutral, with the bigger fixes coming later down the line in Phase 2. Each route gets a “profile” with really in-depth ridership information (and I am so excited to pore through it all), and a big chunk of routes are getting changes. If they were to go into effect, it would be on September 2019. Also, remember to give feedback on these proposals after reading them! Okay, let’s get right to it! SL2: Oh thank goodness, they want to get rid of the 88 Black Falcon Ave deviation. I’ve always thought it was a waste of time, giving the stop a 1/10 in my original review, and the T seems to agree. Eliminating the deviation would save two minutes per trip, plus it would make the route a lot less complicated. Also, the profile seems to admit that way too much service is provided on the SL2 during off-peak times, but I guess they’re not doing anything about that at this juncture. 1 and CT1: Oh yes, they finally played the “Hey, maybe we should cut the CT1!” card. So many transit advocates (me included) have been saying for years that this thing needs to be cut, moving its resources to put better service on the 1. Adding to that better service is the second proposal, which involves having the 1 loop around via Dunster Street in Harvard Square instead of going all the way around the yard. As long as they can ensure buses will be able to traverse Dunster okay (i.e. double down on making sure people don’t double-park and block the road), I am totally in favor of this. That Harvard Square loop has always been a nightmare. 5 and 16: Huh, really interesting idea here. The MBTA proposes cutting the 5 and extending the 16 to JFK Station and UMass Boston weekdays and Saturdays to cover for the lost service. The bus used on the 5 would be added to the 16, slightly improving frequency along the whole route. This is a neat proposal, and it will overall improve service for most people. 8: Make the 8 less crazy? Heck yeah! The proposal is to cut a bunch of jogs from the 8 in order to straighten the route. Most of them are great: straightening the route through the Longwood Medical Area, getting rid of the complex routing to the Boston Medical Center, and eliminating the South Bay Center deviation (a bold move, but I like it). The one cut I’m not a fan of is having outbound buses skip the Ruggles Busway. Apparently this would save 5 minutes of running time, but even if it does save time, it would make finding the bus from Ruggles really confusing, so signage would have to be really good to help people get to the route. Although…5 minutes is a lot of time. Alright, they said that this redesign would have some out-of-the-box proposals. Just make sure those signs are as clear as possible! 9: Oh hey, it’s the exact proposal I made four and a half years ago in my original review to straighten the route’s inbound routing at Broadway. Well, I will happily take all the credit for this one, MBTA! Okay, in all seriousness, it’s great to see that crazy inbound route getting fixed, regardless of where they got the idea from. 18: The proposal here is to have the route skip the Fields Corner busway. This one is easier for me to swallow than the 8 skipping Ruggles, since…well, very few people use the 18. Still, despite saving 6 minutes, I’m gonna say it again: the signage had better be good. Also, despite the route’s profile pointing out that the Auckland Street jog gets “less than one passenger” per trip, the MBTA does not propose getting rid of it. Would it really be so controversial to make people walk an extra one minute to get to Dot Ave? Heck, the time savings for the bus would be equal to or greater than the extra walking time! 19: First of all, like the 8, the MBTA wants to have the 19 skip the Ruggles busway in the outbound direction. Again, just make sure the signage is good. Otherwise, the plan is to extend the route to Kenmore at all times. Currently, it only runs there during rush hour. I like this change – it’ll make it a lot easier for residents of Roxbury and Dorchester to get to the Longwood Medical Area. However, this extension comes with a cost: the amount of buses on the line won’t be increased, so frequency will drop by 5 to 15 minutes. Considering the route runs every hour midday, any further drop in frequency could be devastating. For now, riders will have to decide if the extension is worth it with the frequency drop, but I hope the T will be able to improve service when Phase 2 of the redesign comes around. 26 and 27: At first I was disappointed to see my beloved 26 loop disappear, but this does seem like…well, an interesting proposal. Basically, run the 26 down Norfolk Street to Blue Hill Ave, then down to Mattapan (replacing the western half of the old loop) and have the 27 use Washington Street to get to River Street, then continue with the current route to Mattapan (replacing the eastern half of the loop). There are a lot of advantages here: it eliminates duplicate service on both Dorchester Ave and Gallivan Boulevard, and the bidirectional service would be a lot simpler than the confusing loop that exists now. On the downside, the routes that these were duplicating aren’t frequent enough to cover the loss of service, and the new 26 will only run every 25/45 minutes peak/off peak, versus the current 15/30. The 27 will lose frequency too – apparently wait times will be about 8 minutes longer than they currently are. Overall, I think this proposal has merit, but I would rather wait until Phase 2 to see it happen, so that the frequencies of these and connecting routes can be maintained and increased. 34 and 34E: Okay, so the 34 and 34E would be combined into one route. That makes sense. Also, a deviation to Legacy Place every 30 minutes would be added. That also makes sense – Legacy Place is a major destination, after all, and I complained about the walk from the bus in my review. This last bit is confusing, though: service would be simplified to three variants: Dedham Mall, Legacy Place, and Walpole Center/East Walpole. Well, getting rid of all of the 34E’s other weird variants is great, and I am definitely in favor of that. But…does this mean that Dedham Mall and Legacy Place will only be termini and not deviations? 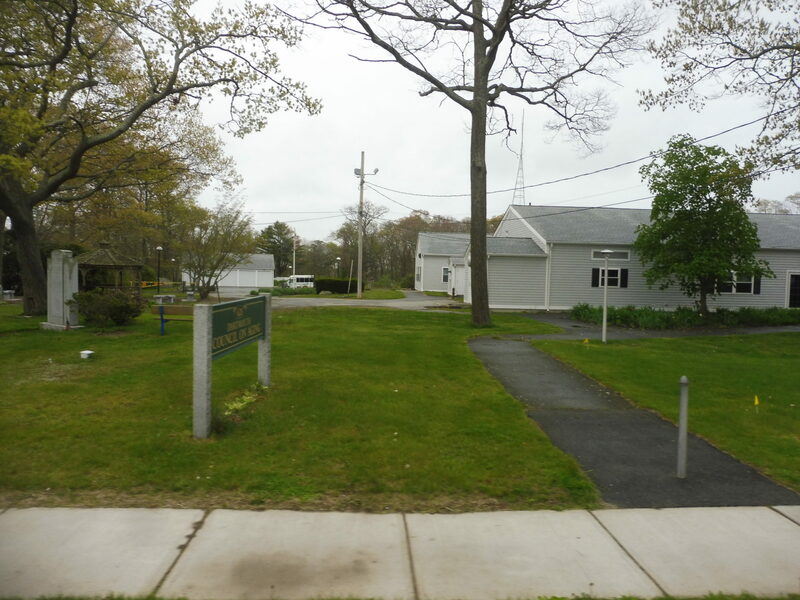 Will Walpole Center trips skip both of those destinations? It’s hard to say, and the document does not explain it well. But hey, I’m all for eliminating variants! 36: The 36 is too confusing! 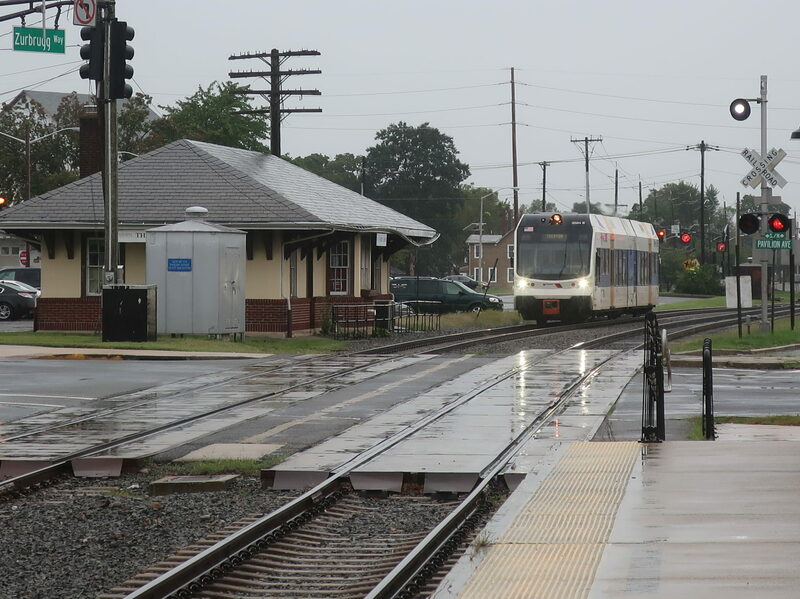 Luckily, it is proposed to operate with just two variants: Forest Hills to Millennium Park via VA Hospital would operate during the day, while it would instead terminate at Rivermoor Industrial Park at night. Buses would operate through the hospital, no longer serving Charles River Loop. Service would be slightly less frequent, but also a lot more simple, so I think this is a great change overall. 37: This is a simple one: eliminate the LaGrange and Corey variant…except during school hours. Well, it’s something, at least. 44: It is proposed to eliminate this route’s John Eliot Square jog that runs evenings and weekends. I don’t have much to say – I think it’s a great idea to speed up service, and very few people use the deviation. 47: The 47 is a crazy route with a lot of problems, so it’s a little sad that its changes aren’t particularly drastic. Basically, straighten out the route in the Longwood Medical Area and bypass the Ruggles busway going outbound. I’ve already covered other routes that are doing this, so my thoughts on those are the same here. 52: Cutting the 52’s variants is the story here. The route will be pared down to just one, running via Wheeler Road. 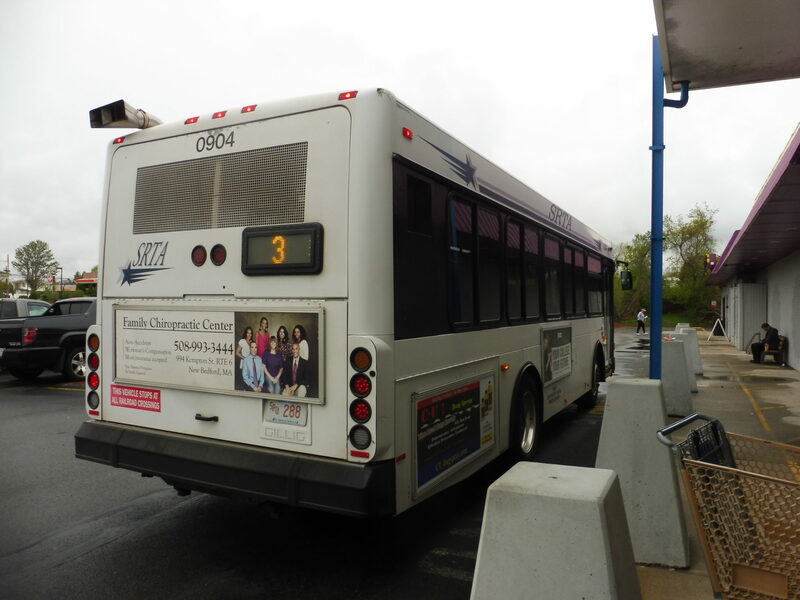 Also, all trips after 9 AM will run to the Dedham Mall, although the Old Navy stop will be eliminated (this will apply to all other Dedham Mall routes, except, for some reason, the 35). It all sounds good to me! 59: Again, the T wants to cut the 59’s variants. All trips are proposed to run via Needham Street. 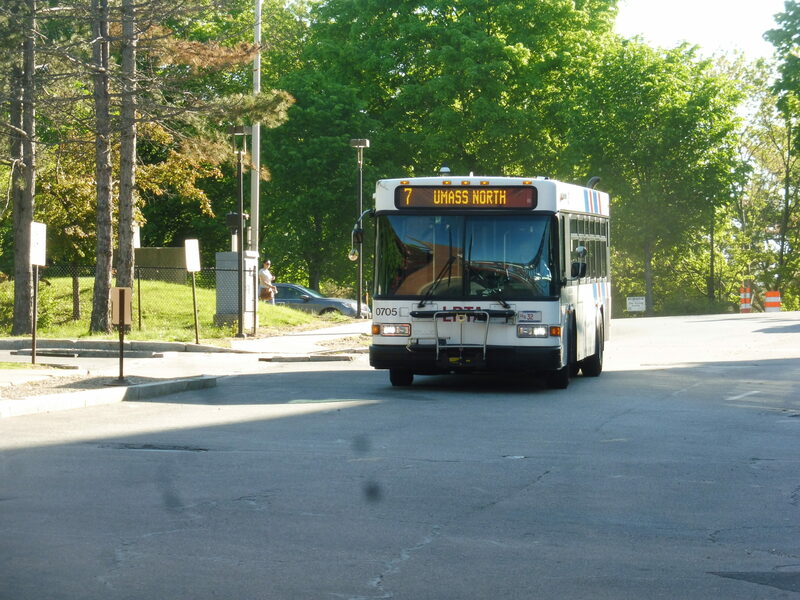 60: The 60’s route would be shortened slightly by cutting it back to Chestnut Hill Square. 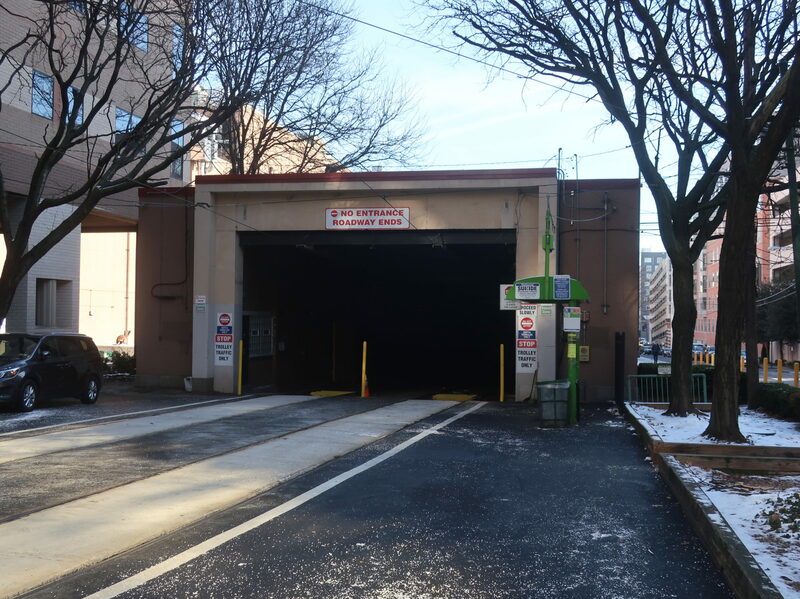 This does screw over riders to the Chestnut Hill Mall, who would have to walk across several parking lots and treacherous Route 9 to get to the bus. All this for…service that’s one minute more frequent. Huh, well, that’s a letdown. It looks like Chestnut Hill Square is a much bigger destination than the Chestnut Hill Mall, though, so I guess it will save those people time. 64: The 64 has two, count ’em, two proposals. I’m going to start with the second one, because it’s one I’m fully in favor of: get rid of the Hobart Street jog. Hobart Street is criminally narrow for buses, and this change has been a long time coming. Cutting this jog will improve headways by one minute (yay? ), but more importantly, it will save people a lot of time from not having to sit on buses struggling to make a turn that they shouldn’t have to make. And then Proposal 1. Now, this is one that a lot of Cambridge transit advocates have been clamoring for: extend the route to Kendall Square all day. Well, I like that they’ve chosen to run it via Main Street, which should save time. I’m just not sure how big the market is for midday one-seat rides to Kendall Square that will take longer than just connecting to the Red Line. Plus, overall service on the route will decrease from every 35 minutes middays to every 45 minutes. I hope I can be proven wrong here, but I don’t really see this as an overall positive extension. 65: Okay, this is an interesting one. The proposal is to reroute the 65 from Kenmore to Ruggles. I’m going to give a tentative thumbs-up here. The route intersects with every Green Line branch that serves Kenmore, so it’s easy to transfer if you’re going there. The connection to the Orange Line would be useful, and the route would run straight through the Longwood Medical Area on its way to Ruggles. This change would result in up to ten minutes of lost frequency, but at least the route is providing a new connection instead of the redundant connection with the 64 extension. 70 and 70A: Hallelujah, let’s make a start on fixing this beast! First of all, the 70 will see more trips running to Market Place Drive middays and evenings, and hopefully with this change will come better coordination between the route’s different termini. The 70A will, huzzah, be relegated to its own loop from Waltham to North Waltham. The route will no longer be a figure-8, becoming more of a figure-backwards-9, leading to simpler service. Also, the loop would gain Sunday service! Although…huh, it would apparently be every 90 minutes. Ugh. Well, it’s a start. 72, 74, and 75: This one has been a long time coming. The 72 and 75 will finally be combined at all times, with the 75 running via Huron Ave…oh, except at rush hour, the 72 will also run. Okay, weird. I wonder if with the new wires, the T will now have a rush hour-only trackless trolley route! Hey, better than nothing. Although in all seriousness, I don’t even think the 72 needs to run at rush hour. Other than that, the 74 would omit its Bright Road deviation, saving time for through riders. These changes combined would allow for better overall bus frequency for West Cambridge and Belmont, so yay! 89: Eliminate the 89’s Clarendon Hill branch? Sure! This will simplify the route, and the 87/88 generally provide frequent enough service for the transfer to Clarendon Hill at Davis to not be too painful. 90: I’ve never thought about it, but this one makes perfect sense! The 90 would get cut back from Wellington to terminate at Assembly Square. No longer will buses have to deal with the brutal traffic to Wellington that is redundant to the Orange Line anyway! Alright, well, that’s it, what a great change…wait, they want to have buses skip Sullivan??? Okay, I have some beef with that. Unlike with Ruggles or Fields Corner, Sullivan is not in a walkable area. Making 378 Sullivan riders per day walk seven minutes along and underneath highways just to get to the Orange Line does not seem like a good idea. Look, yes, it is an annoying deviation. But it’s serving a train station! It’s important! A ton of people use it! 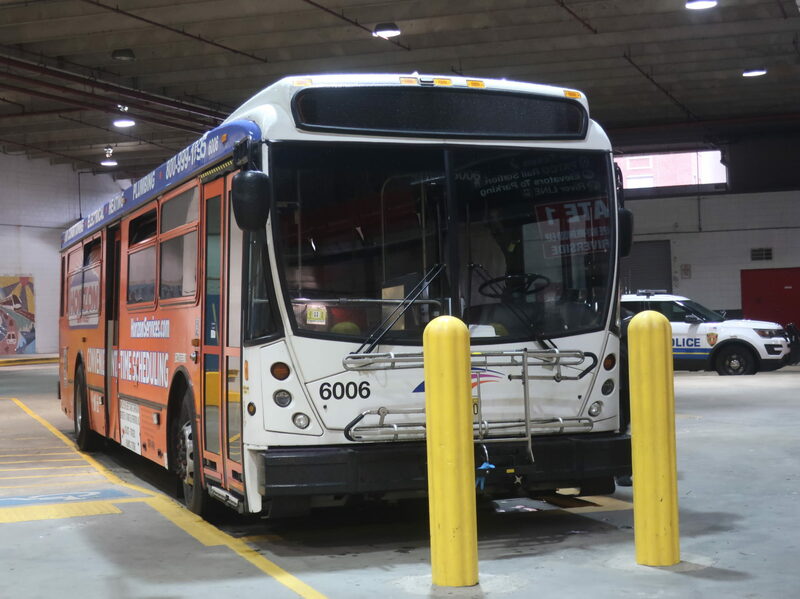 You cannot call Lombardi Street a connection with the Orange Line, which combined with the route’s truncation at Assembly, would mean the 90 would no longer connect to the Orange Line. And that’s no good. 92: The proposal here is to cut the 92 from Assembly Square to Sullivan full-time. Yes, that is a great idea! It will improve frequency significantly, and riders can just take the Orange Line to Assembly instead. 93: Yeah, sure, cut the Navy Yard variant. Makes sense. 95: Ooh, this one is juicy! Basically, the 95 would stop serving Playstead Road and instead run to…Arlington Center! You don’t realize how close those Medford Square and Arlington Center are when you’re on transit because it’s basically impossible to get between the two, but now there will be a direct connection! Yeah, I love this. Very few people use the Playstead Road portion of the route to begin with, and those that do can just walk to the 134 to Wellington instead. The MBTA says that people will have longer wait times, but apparently this new routing will run every 30 minutes, which is the same frequency as the current route. Maybe it will also be every 30 at rush hour (versus every 25)? Well, I still think that’s a decent trade-off for what will be a fantastic direct connection. 106: They want to cut all service back to the Lebanon Loop. Absolutely. Let’s do it. Barely anyone uses the service to Franklin Square to begin with, and this will make the route so much simpler. 111: I’ve never understood why the 111 gets extended to Broadway and Park Ave in the evening and only in the evening. Well, apparently, neither does the MBTA, because that extension would be eliminated with this proposal. This will allow for a simpler schedule and more frequent service for a route that needs as much service as it can get. 120: First of all, the 120’s awkward and pointless loop in Central Square, East Boston would be eliminated. Good riddance. 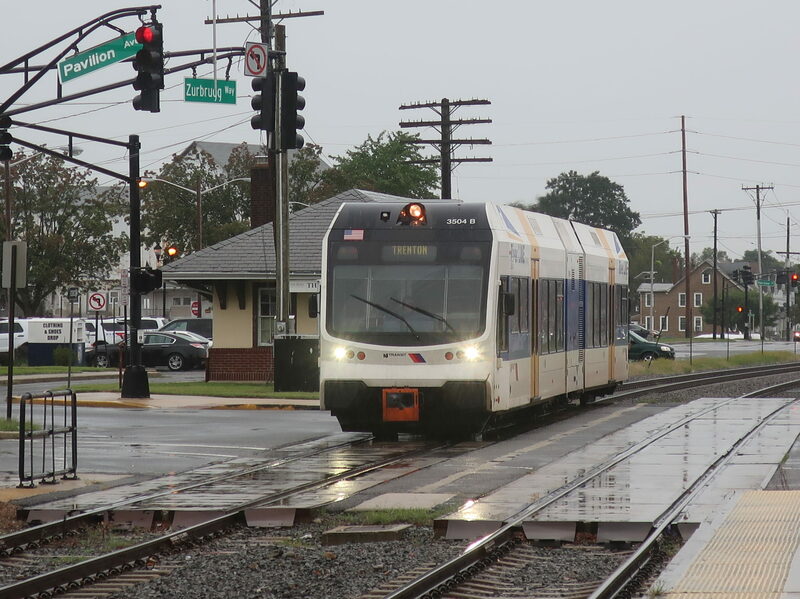 Also, the terminus would be moved to Jeffries Point to improve the reliability of trips leaving from there. Yeah, I think that makes sense! 131, 136, and 137: Another one that fell under my radar but is a good idea. Aside from early-morning trips, the 136 and 137 would be cut back to Oak Grove, allowing for more frequent service on those routes. As for the 131, it would serve Malden Center full-time, covering for the lost bus service along Main Street. Yes, that would affect the 131’s frequency, but the trade-off is worth it to improve headways on the far more important 136/137. 134: Okay, uh, the 134 has this one deviation that runs six times a day that serves the Cambridge District Court. This proposal is to, uh, not do it anymore. Okay, yeah, that’s awesome, but is that really all you could do for this variant-filled monster? Ugh, there had better be some big changes in store here for Phase 2. 201/202: With this proposal, the 201/202 would remain a loop on weekends, no more serving North Quincy. This seems reasonable – it would improve frequencies, and the section to North Quincy mostly serves offices anyway. There is just one caveat: the report claims that “Route 210 continues to provide Saturday service [along the North Quincy segment].” Uhh…no, that’s completely wrong. The 210 only runs between North Quincy and Quincy Center on Saturdays. It’s not a huge deal, but it’s important to note that this service will well and truly be eliminated on weekends, with no replacement whatsoever. 215: This proposal would cut an early morning round trip to North Quincy meant to serve the first Braintree train of the day. Instead, the trip would leave earlier in the morning and run to Ashmont to get the first train from there. This will make the route that much simpler, and it won’t have a huge effect on riders. 220: Some more variant cutting here. Buses would no longer serve the Hingham Shipyard, as well as, interestingly, the Hingham loop. I totally get cutting the Hingham Shipyard deviation – it only operates twice a day in each direction, the shipyard is an easy walk to Lincoln Street, and only 3 riders per day use the deviation. The Hingham loop is more interesting, though. It would improve frequency a tad, but some people would lose service. How many? 10 per day. Oh! Okay, wow, I did not realize the loop was that lightly used. Alright, sure, cut it! 222: More weird Quincy variants. This proposal would cut the odd midday trips to Essex Street, losing just 3 riders per day. Yeah, sounds good to me. 225: I remember looking at an old MBTA system map and seeing a route 252 direct from Braintree to Columbian Square. I always thought that looked like a really convenient connection. Well, it’s (sort of) coming back! Yes, the 225 would be cut back full-time to Lincoln Square, while a new route, the 226, would run from Braintree to Lincoln Square, then down to Columbian Square! This is an awesome idea that will improve frequency for the 225, although: we have no idea how often this 226 character would run and when. There’s no indication of it in the proposal. So, we’ll have to wait and see how useful the service actually is. Oh, also, service will be “reduced” on one of the 225’s variants, but apparently not entirely cut. Darn it, I was hoping it would be simplified to just one! 238: Remember when the MBTA cut the 238 back to Quincy Adams and then immediately rescinded it because of the backlash? Well, they’re proposing it again! I’ve always been in favor of this plan. 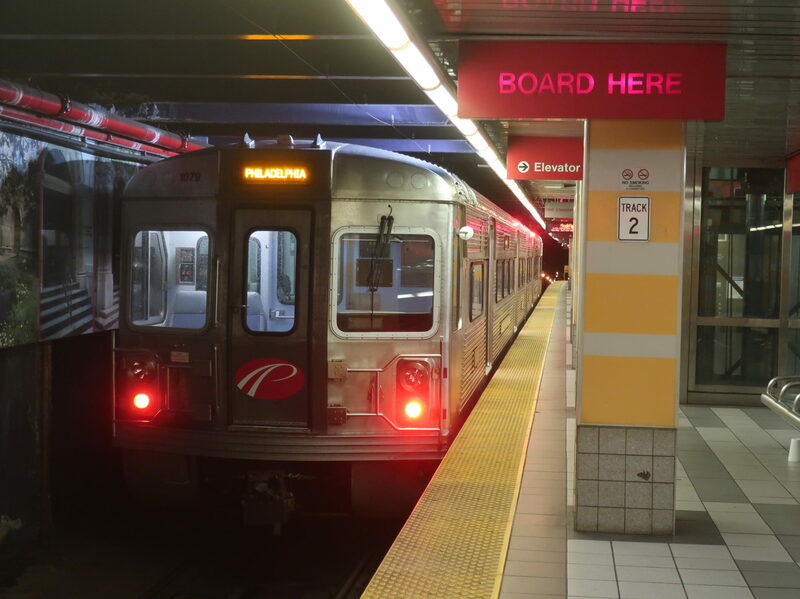 This time, too, the T says it will improve frequency on the route with the new cutback. Even better! 350: I remember way back in 2012 when my predecessor, (T)he Adventure, proposed that the 350 should serve Northwest Park. And that was when the place had barely developed! Well, finally, the 350 would serve Northwest Park, including its many offices and the trendy 3rd Ave retail development. This would increase headways by five minutes, and it would force buses to skip the Burlington Mall (stopping on the Mall Road instead), but this would overall be a huge boon for the Northwest Park development, particularly 3rd Ave.
411: Oh, the crazy 411. This change will make it just slightly less crazy, at least in the peak: buses would only run between Malden Center and Kennedy Drive at rush hour. Yes, that is cutting off a ton of the route, but it’s a part of the route that’s A) covered by other buses, and B) doesn’t get a lot of ridership at rush hour anyway. I like this. This makes a lot of sense. 424: Part 1 of the Great De-Expressing of the North Shore is one of the easiest to swallow. After all, morning 424s already end at Wonderland. This proposal would make the evening ones end there too. It would also take a more efficient route to get to the station. 430: The 430 currently takes a crazy route in Saugus, running from the Square One Mall to Cliftondale Square and then back up to Saugus Center, then looping around to serve the Saugus Iron Works. This proposal would run service directly from the mall to Saugus Center, as well as cut the Saugus loop. Ultimately, this would speed up the route a lot and give it higher frequencies. The disadvantage is that Cliftondale Square would lose a direct connection to the Orange Line, though, and the transfer between the 429 and the 430 probably wouldn’t work out a lot of the time. It’s a big trade-off, and more people use the route from Cliftondale Square than from Saugus Center – although then again, maybe that’s because it’s so circuitous. We’ll have to see if the 430 ends up getting more Saugus Center riders, I guess. 435: This route would lose its twice-daily Pine Hill variant. Anything to simplify this mess of a route seems good to me. Only 4 riders would lose service. 441, 442, 448, and 449: Bye-bye, 448 and 449! All service on these corridors would be to Wonderland only. It looks like the T is really gonna double down on service from Lynn to Wonderland, including better frequencies and new express runs between Lynn and Wonderland. I won’t be fully happy until the 441/442 become Key Bus Routes, but this seems like a good start, a good start indeed. 455/459: So long, 459! All service on this route would only run to Wonderland. 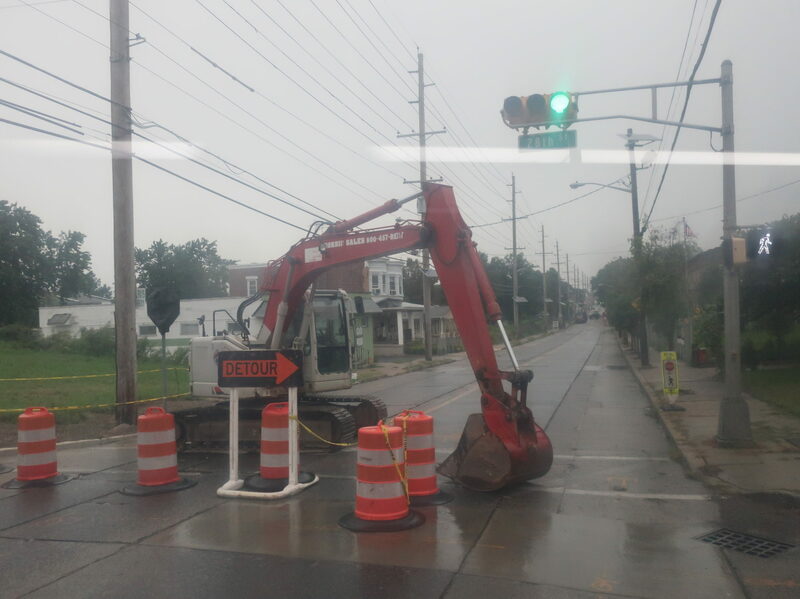 This will allow for huge frequency increases for the 455, with average wait times decreasing by 20 minutes! And since this is the final cut express route, let me just explain why I’m happy they’re getting rid of these: the Blue Line is faster than sitting on traffic-prone highways, and people will actually save money from not having to pay an express bus fare. Even for those going to the Seaport, the SL3 now makes that commute viable – even though it runs through the Ted Williams, you’re sitting in the same traffic that you would’ve on the express bus. 501, 502, 503, and 504: A radical change for Newton Corner! Now, these express routes will only loop Newton Corner when they have to, i.e. the 501/503 will do it in the outbound direction and the 502/504 will do it in the inbound. This mainly saves time for 502/504 riders to Watertown, who used to have to sit through the Newton Corner deviation in both directions. I like this change, but I do hope the MBTA makes it clear how to get to and from Newton Corner by express bus. If anything, having all four routes share a schedule card might be the best way to make the service pattern as clear as possible. Okay, and those are the 47 changes documented in Phase 1 of the Better Bus Project! Overall, I think most of them are great. Yes, there are plenty of routes that should’ve been tweaked but weren’t (hi, 112) and a few changes that I wasn’t a fan of, but I am so happy to see the MBTA finally giving the bus system some love. Let me know what you thought of these changes and if you disagree with me on any of my opinions, but more importantly, let the MBTA know! This redesign is supposed to be based on rider feedback, so make sure you give them something to work with. Oho, we’re getting some PATCO up in here! 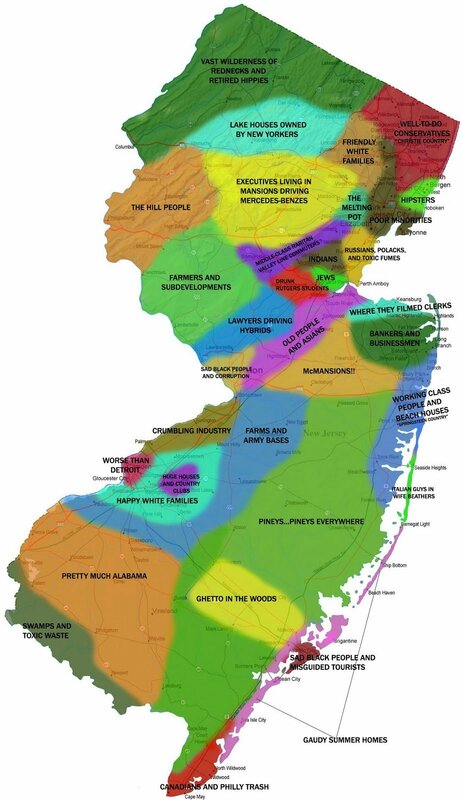 As much as I love going to New Jersey (I know a lot of people hate it, but you can’t deny it’s one of the most interesting states in the country), the main thing keeping me away is the fact that, despite having a SEPTA pass, I still have to pay to get there! Well, when trying to ride all of the transit modes in the Philadelphia area in one day, I made an exception and headed to 15th/16th and Locust on an early Sunday morning to go to the Garden State. It’s such a nice entrance and I can’t even get an in-focus photo of it! This station has no fewer than five stair-based entrances spread between 15th and 16th Streets, and four of them are just staircases into the ground. That’s nothing new for Philadelphia. However, there is one fancy entrance near 16th Street that actually takes up the front of a building. Of course, it is still just a staircase into the ground, but at least it’s different. 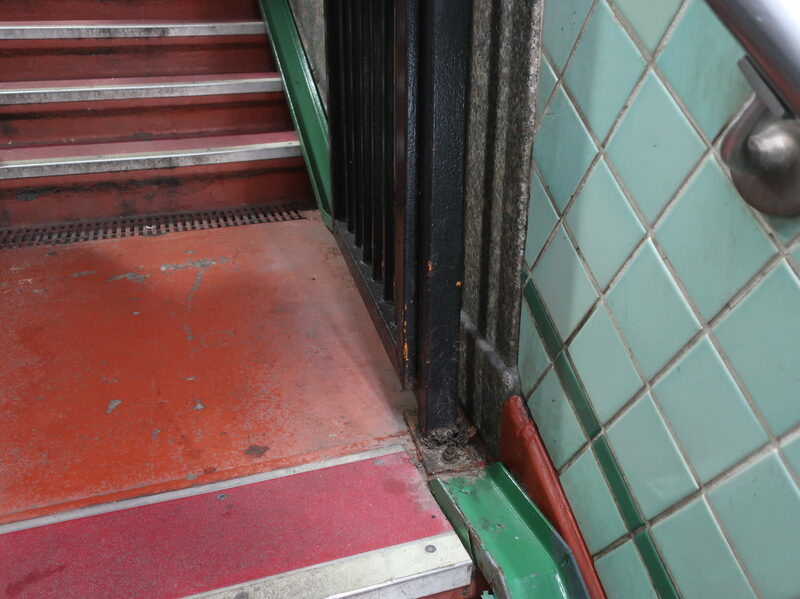 Luckily this station is accessible, but boy, the elevator sure is lurchy. 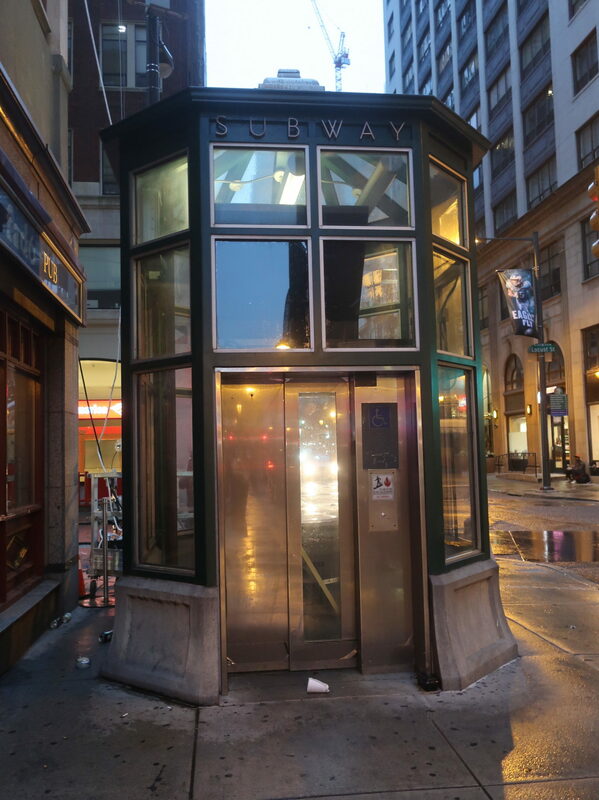 Located at 15th Street, the doors will close on this thing, but it’ll wait a few seconds to actually start moving. During that time, you contemplate whether or not you’ll be stuck in here for the rest of your life, but then, with a loud screech and a shudder, you’re finally going. The same process repeats in reverse when you get to the bottom. Oh, and don’t forget about the trash on the floor and the horrible smell! Okay, I feel obligated to include a photo of the regular entrances as well. Here are two of them. 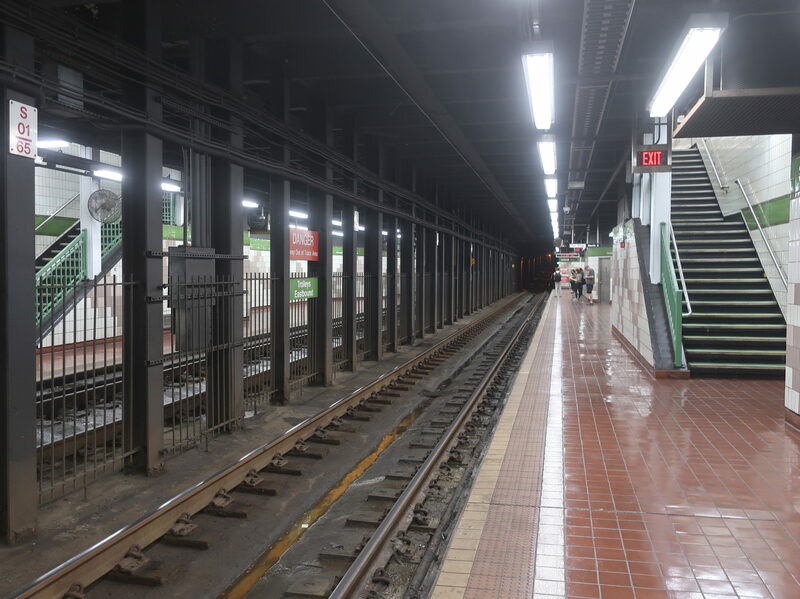 This is my first station review that’s connected to the Center City Concourse, so I should bring that up. Basically, Center City has this huge transit concourse that runs between a lot of the stations downtown. 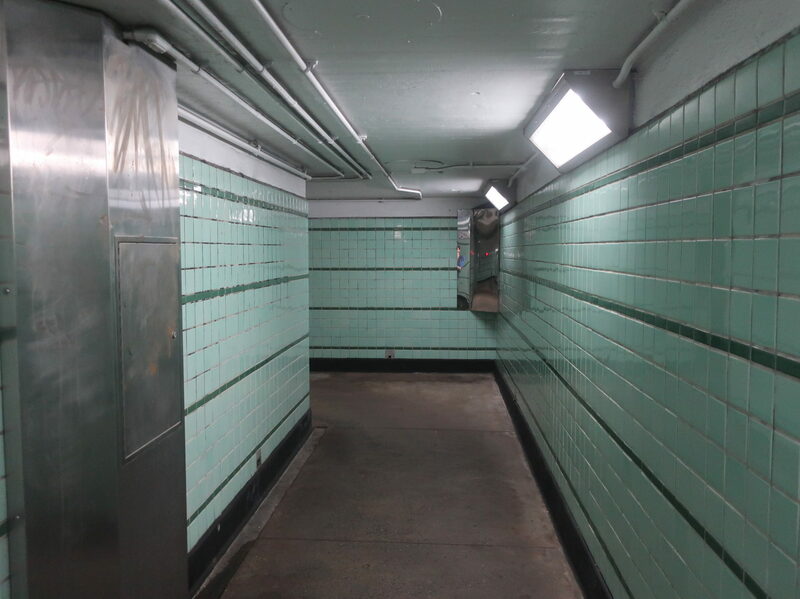 Its usefulness mostly comes down to being able to walk between stops without having to go outside, but the corridors are often stark and dingy. In this case, the concourse is quite useful for getting between PATCO and the Broad Street Line (although people are far more likely to make the connection at the next stop east), but it’s clear where PATCO ends and SEPTA begins: the PATCO area is nice and clean, but once you pass through a doorway, the ground becomes dirty, the architecture gets bland, and on this early Sunday morning, a few people were making the big wide SEPTA hallway their home for the night. 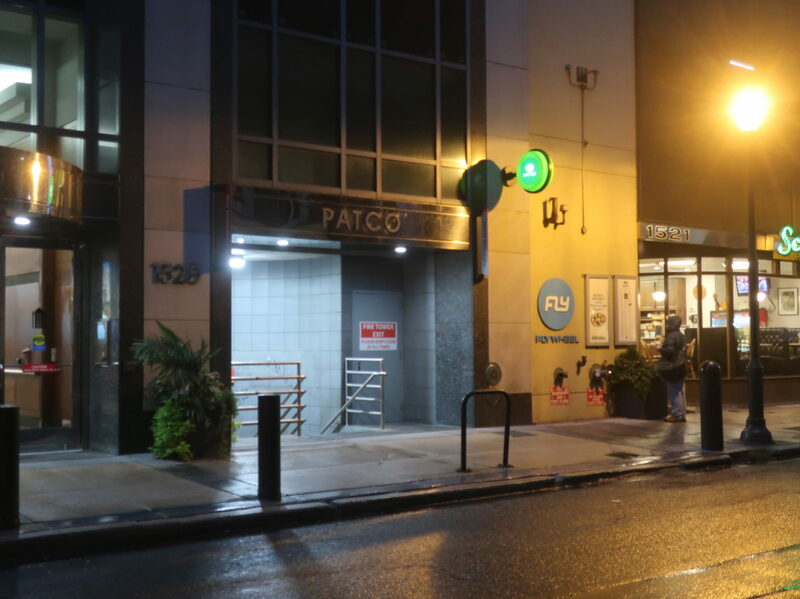 Well, okay, the architecture for the PATCO mezzanine is pretty bland too, but at least it has these cool green lights on occasion! No, but seriously, it’s a bad mezzanine. There’s a ton of space but not nearly enough fare machines or gates, so it all ends up feeling empty. Plus, since PATCO has zone fares, you have to exit through the faregates as well, forcing them to handle double the traffic (at least SEPTA usually has exit-only turnstiles to lighten the load). 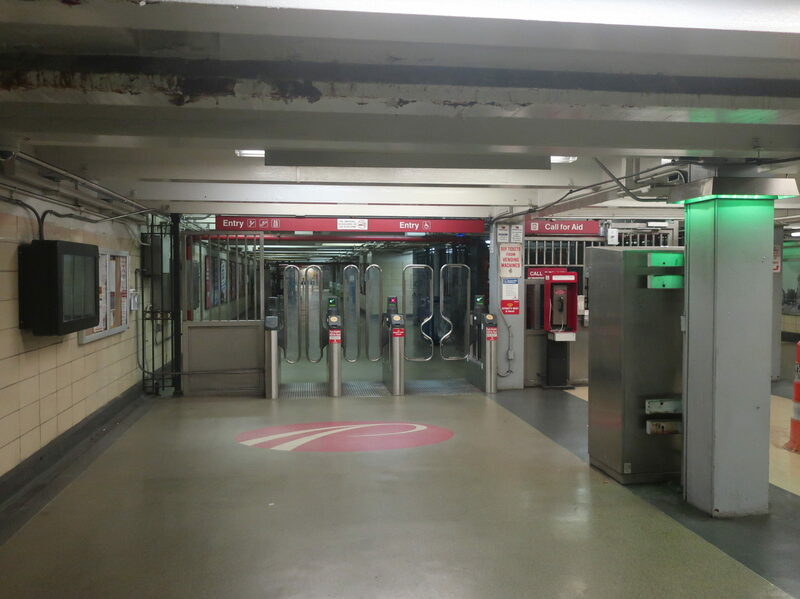 The mezzanine has two sets of faregates, one at each street, and a hallway between them. Now in fare control, we have a few things you would expect: some wastebaskets, stairs, and a this-time-not-smelly elevator down to the platform. However, this area also has another fare machine, meant for people who might’ve bought the wrong zone on their ticket, as well as bike racks. Yes, the in-station bike racks are actually within fare control, which I guess makes them harder to steal, but that also means you have to lug your bike through the fare gate. I would say it evens out to be net neutral. Every PATCO platform has a specific color, and this one is yellow. 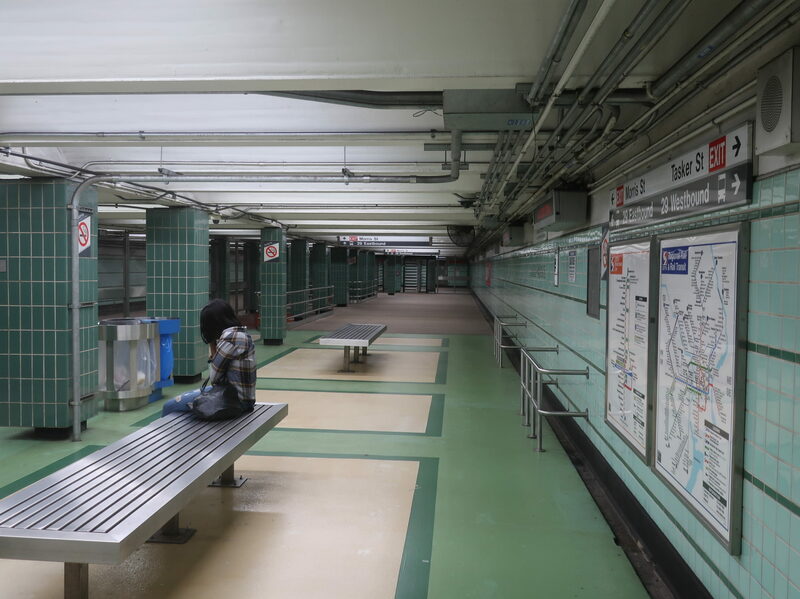 The platform has that sleek retro-future feel that I get from a lot of PATCO stations (just check out those benches! ), and it has what you would expect: seats, wastebaskets, PATCO’s cool tactile maps, and a screen that looked to be in testing at the time. Also Xfinity Wi-Fi, apparently. The station also has photos of Philly on the walls, which is nice. 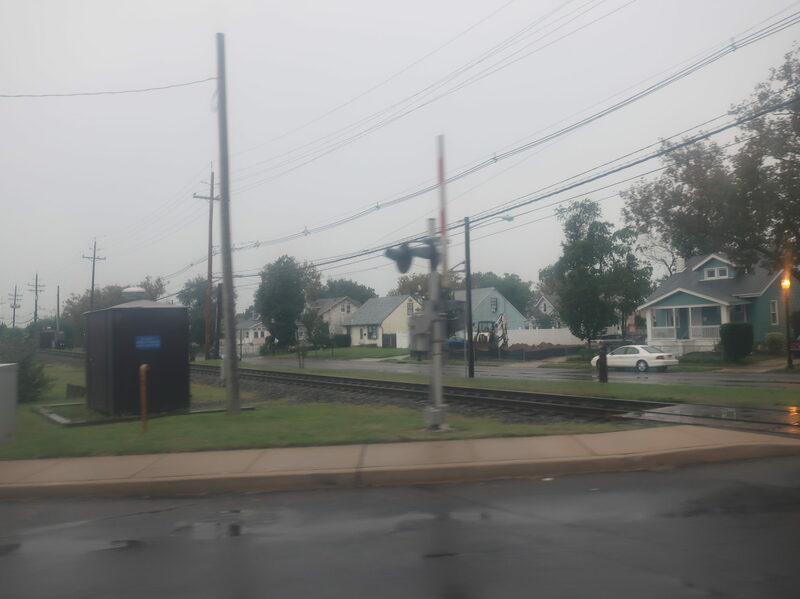 Since this is the first stop on the line, there’s probably gonna be a train waiting here, leaving most people with no time to appreciate the platform much. After I was done with my pictures, I too hopped onto the waiting train. Ridership: Well, darn, PATCO doesn’t give ridership information by station. And 7 AM on a Sunday is really not the time to be analyzing ridership, when very few people are using transit. 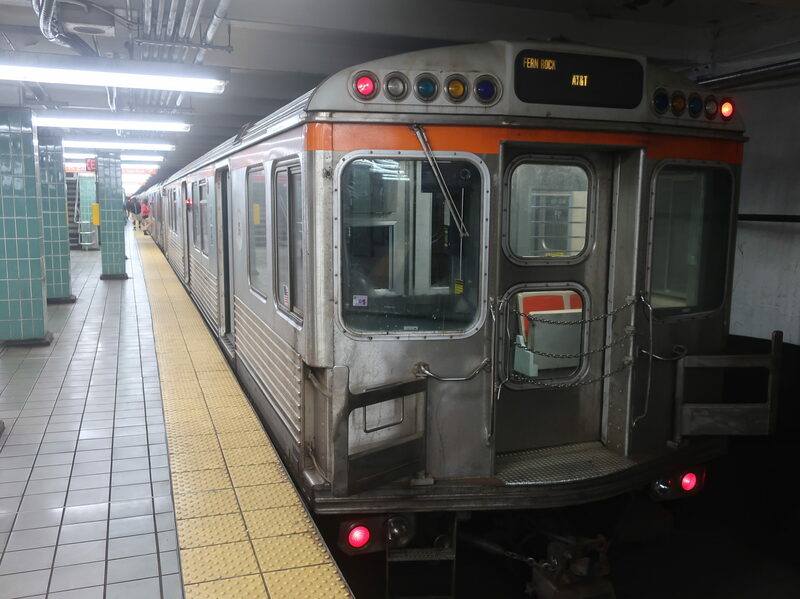 Well, I’ll say this: people most likely transfer to the Broad Street Line at the stop before this one, 12th/13th, leaving 15th/16th to be used for what’s around it. What is around it? Rittenhouse Square. Well, that’s a big boost for pleasure-seeking off-peak ridership, then! Pros: This is a decent place to end the service. I know it was originally supposed to be part of a loop around Center City, but as it stands, the station is two blocks from Rittenhouse Square, which seems fine. And the station itself is pretty nice, feeling generally much cleaner than SEPTA stations do. Cons: The elevator heading up to street level was an unpleasant experience to ride. The mezzanine feels sparse, and when everyone has to enter and leave through the faregates, I can see things getting pretty congested during busy times. Nearby and Noteworthy: Rittenhouse Square, of course! Everything around there is pretty expensive, but I still enjoy walking through the park and around the neighborhood. Yeah, this is a good station. Why didn’t it score higher? The problems it does have are pretty major, and there isn’t anything special here to blow me away and help overlook the other issues. Still, this is better than most SEPTA stations, and I know that’s not saying much, but I still like this one anyway! So that’s what we’re up against. The NB 6. Ugh. We began by heading west on Mill Street, passing houses and a few businesses. 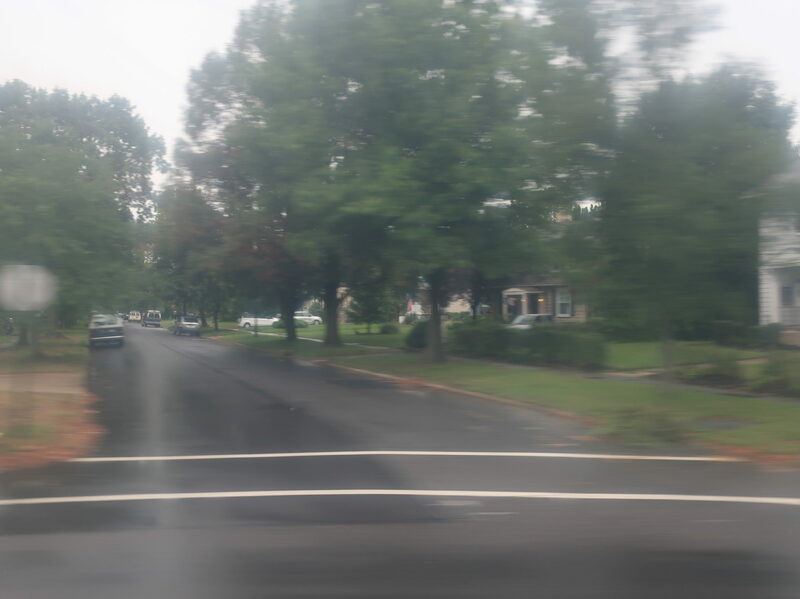 We then turned north onto Park Street (bearing in mind this route’s final destination is south), a local road through a residential neighborhood. Next, it was a right onto Parker Street for two blocks, then a left onto Shawmut Ave.
Yup, just this for a while. There were some small businesses at the intersection with Durfee Street, then a bit of industry at Potter Street. We turned onto Potter, a local road that went past a housing development. When that road ends, many trips just take a left. But I was on one of the ones that gets to do an additional deviation! Oh boy! Right we go! That housing development on Potter Street. So we went over Route 140 and entered a residential neighborhood. The following streets are so local that you really wouldn’t expect a bus to be using them. Also, bear in mind that our driver was flying around each turn, probably to get this stupid deviation over with faster. Okay, here we go: left on Granite Ave, left on Sandstone Drive, right on Pamela Drive, left on Carriage Drive, right on Bryant Lane, right on Hill Road, right on Rockway Street, right on Roseanne Street, left on Pamela Drive, left on Sandstone Drive, right on Granite Ave, right on Rockdale Ave. I had no idea where we were, all I could see was houses, no one was getting on or off, and I just wanted the ride to be over. The right side of the picture that’s in focus is me before the deviation. The left side that’s all blurry is me after the deviation. I have no idea why this photo came out like it did, by the way. 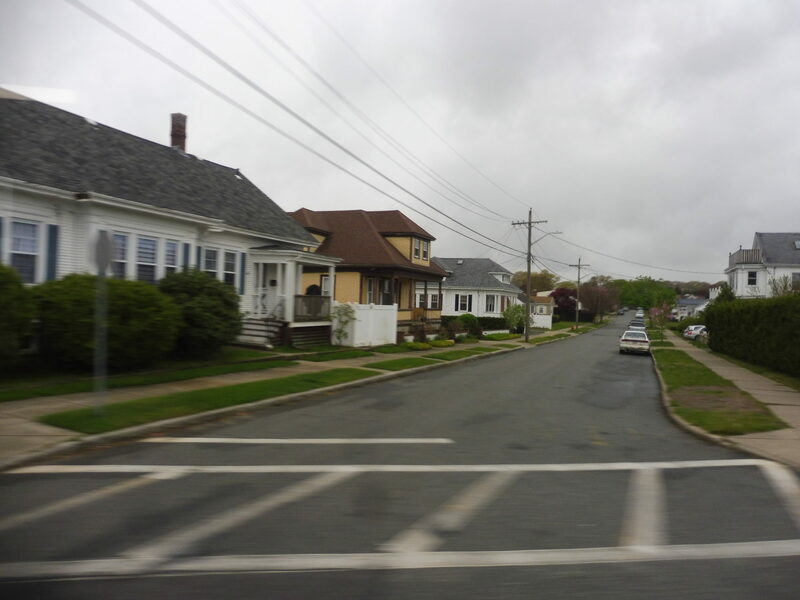 Well, at least now we could continue with the regular route on Rockdale Ave, which was mostly residential, although we did also go by an elementary school and the New Bedford Police Headquarters. At this point, we had been driving for about 20 minutes, but crossing the one-way pairs of Mill and Kempton Streets, it dawned on me that the 9 and 10 run here…and arrive in a third of the time! It was houses after the brief splurge of businesses around those streets. Oh, hey the 6 has a by request deviation to the Buttonwood Community Center! That’s right, if you’re going outbound, just ask the driver to take you there; if you’re going inbound, you have to talk to the secretary at the community center to call SRTA to deviate the bus for you. Oh, gee, that’s real intuitive. Luckily it only does this deviation on weekdays (although I doubt it happens much to begin with), so we just sped by the community center and the rest of Buttonwood Park. The edge of the park. Oh, this route is nefarious. Just when I was starting to get used to being on the same street for a while, we got to do…a deviation! Yes, we took a left on Hawthorn Street, a road that was, yes, way too local for a bus, passing, yes, more houses. These were generally bigger and more spacious than the ones we had been seeing before. We turned onto Page Street in order to serve Saint Luke’s Hospital (along with the 3), then it was a right onto Allen Street to head right back to where we were before. There were a few businesses when we turned back onto Rockdale Ave (for what felt like the 50th time). It quickly turned back to houses, though, but there was also a bit of retail and a big cemetery, so that was a nice change of pace. Finally, we reached Dartmouth Street, and this was where we made our final deviation into a Stop & Shop. The bus stopped in this weird industrial area next to the store, but at this point, I really didn’t care. We were done. 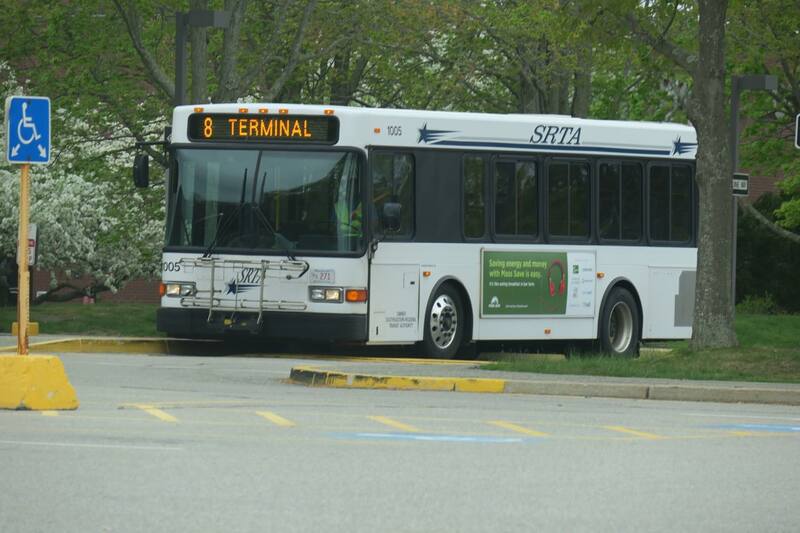 It had already become the 5 when we got to Stop & Shop, so here’s the bus back when I got on at the hub. Ridership: This route has the second-lowest ridership in New Bedford if you don’t count the North End Shuttle (which, frankly, I don’t). It got about 252 people per day in May 2014. Pros: Well, hey, on the bright side…it does serve stuff. That is an advantage over the North End Shuttle. 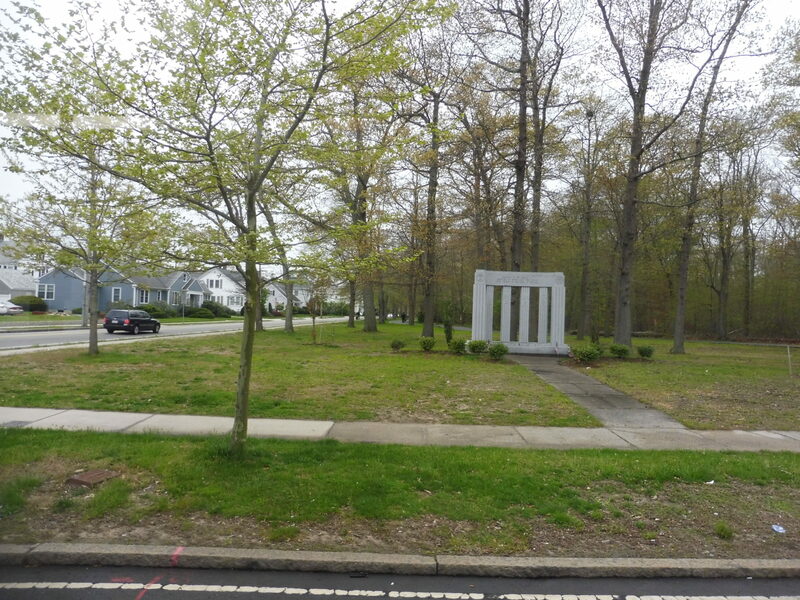 Nearby and Noteworthy: This is the closest bus route to the Buttonwood Park Zoo, which does look awesome, but just take the 9 or 10 and walk a little bit. It’ll be a lot less painful. I turned the 6 into a fully circumferential route and had it take over the 11‘s deviation to Market Basket, thus eliminating its redundant portion with the 2 in New Bedford (and providing overall more residents with a one-seat ride to Market Basket). One flaw with this plan, though, is that the 6’s radial section out of New Bedford is lost. This is definitely a tough tradeoff, but most of that part of the route is within a 3-minute walk of the 8. In Fairhaven, I originally had buses going to the town center further south on Main Street, since I had lamented the fact that no bus actually runs there. However, people probably wouldn’t take the bus there, especially when it’s a circumferential route, plus residents would likely oppose and the streets in that neighborhood are very narrow (not that that hasn’t stopped the SRTA before). The first time my family came to Philadelphia, we stayed at a hotel right next to this station. I was shocked when we took the trolley for the first time. “Where are the fare gates??? ?” I asked desperately. Oh, Miles. You had a lot to learn. As much as I like my dorm’s location and transit options, I have to hold some jealousy for those who live in King’s Court, since the trolley station is right outside that dorm! 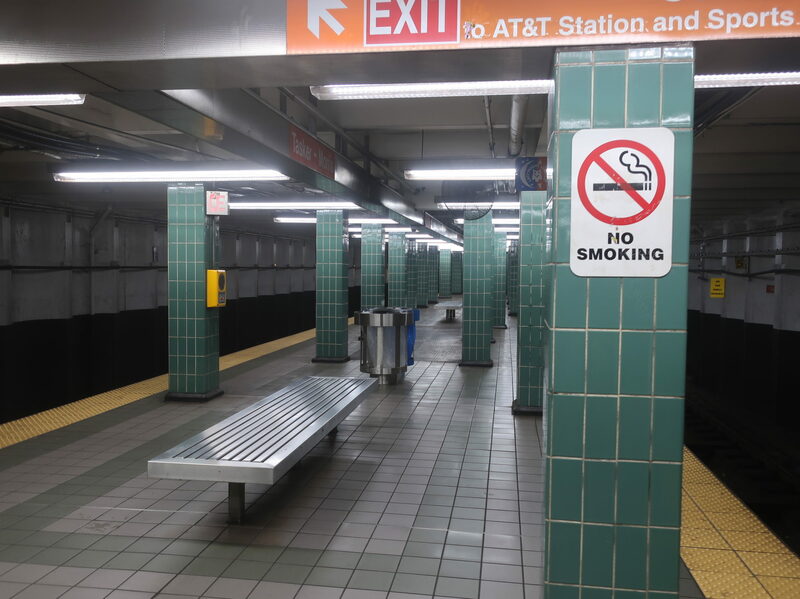 Plus the El station at 34th Street is only a few blocks away. Hmph. Well, anyway, I’m stalling, because these two entrances are just staircases going into the ground and that’s it. Well, would you look at that. A big, giant, open mezzanine with nothing in it (well, aside from a nice mural on the far end). Hmm, I have a small proposal that might help to fill the space a little bit. Definitely a little out of the box, so bear with me. How about putting in…FARE GATES???????? No, of course, we have to deal with the classic trolley business of flagging things down, paying on board, and just generally having a terrible and sad time. Look at this platform, it’s just so…bleh! I’m glad that the walls and floors are generally clean, but the industrial-like ceilings? The mysterious yellow liquid oozing down the tracks? Yeah, no thanks. Looking toward the tunnel entrance. A 13 coming into the underground station. Ridership: Oh right…SEPTA doesn’t release ridership information for the trolleys. Well, the station is the closest to many of UPenn’s buildings, so most of its ridership is probably from university workers and students. I’m sure it gets a decent number of riders per day. As for the portal…I honestly can’t see much reason in using that to go into the city when you have four times the frequency in the underground station! Pros: It’s a straightforward station that’s very easy to navigate. The mezzanine has that nice mural. The portal…has…shelter…? Cons: Look, I get the portal not having fare control, since it’s basically a street stop. But the subway station has this perfect mezzanine that would be so easy to install fare gates in! Like, way easier than 19th and 22nd, where they really had to get creative to install the things. Other problems here include the dinginess of the subway station and the overall uselessness of the portal. So, you know, this station is pretty bad. Nearby and Noteworthy: UPenn, wooooooo! Also, the free Institute of Contemporary Art is right outside the trolley entrance, but bear in mind it’s closed until the beginning of February. There are definitely no redeeming qualities to this one like there have been with my other trolley station reviews. 37th Street had the cool trolley entrance and 19th and 22nd Streets had fare control, but there’s nothing here that could raise the score above a 3. I mean, okay, the mural in the mezzanine is nice, but that’s certainly not enough to add a point. Put fare gates in there already! This went over really well when I did it for the MBTA, so let’s try it for the RTAs! Each system changes its schedules at different times, so I’m not sure how often I’ll do these round-up posts, but this one will cover any changes that are happening soon or have happened recently (or not so recently…). No new changes have happened at BAT since July, when they increased their fares by 25 cents ($1.25 to $1.50). If you ride the system regularly, you’re definitely aware of that by now. One thing to know about CATA: they never change anything. In this sense, they’re keeping the tradition alive. I actually did review the route in question here, so I’m gonna include it! Starting Monday, the 23 will gain two midday trips. Nothing much to say about it, it’s just a really good addition and provides extra connectivity to Amherst and UMass! Back in August, GATRA added a new route just to make me as mad as possible. The Wareham-Plymouth Connection seems to be designed to get people to a school, and it is very, very hard to ride. That’ll sure be fun to review! Also, in February, the system will be undergoing a really hefty fare increase: from $1 to $1.50! They’re quick to point out that it’s their first fare increase in 15 years, but that’s still a lot to ask. The cost of passes and dial-a-ride is rising with the same proportions, but ADA paratransit takes a massive jump from $1.25 to $3.00. I don’t entirely know what the difference between that and dial-a-ride is, but a 140% fare increase is crazy! The one silver lining is that transfers will now be free. But honestly, GATRA is not really a system designed around transfers, and I can only see them being useful for sneaky return trips (e.g. take the 10 one way to Emerald Square Mall, then “transfer” to the 12 for the return journey). The LRTA increased its fares somewhat recently (as in, sometime in 2018), but I can’t remember when it happened. Again, if you ride the system regularly, you know this happened by now. MART’s last big service change was in October, but I’ll go over the main highlights. Fitchburg Routes: The changes in Fitchburg were small. A few trips at the beginning and end of some routes’ days were removed (making MART end even more ridiculously early than it did before), while changes were made regarding Reliant Medical, which has moved locations. 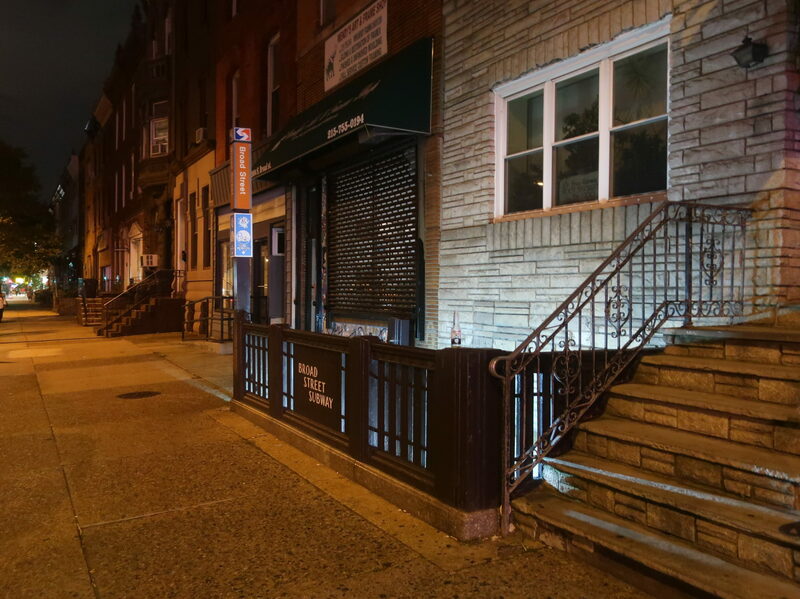 The 7 and 8 no longer serve their former branches of the clinic, while the 9 now has an extra deviation to a new one. 7A: Ah, the 7A…one of the dumbest bus routes I’ve ever ridden. Well, it no longer exists, sort of. The route is now a call-in service with the same hours as the former fixed route. This makes sense – it’s one of the rare occasions where a dial-a-ride vehicle will get more passengers than a fixed route. Seriously, the 7A was really stupid. 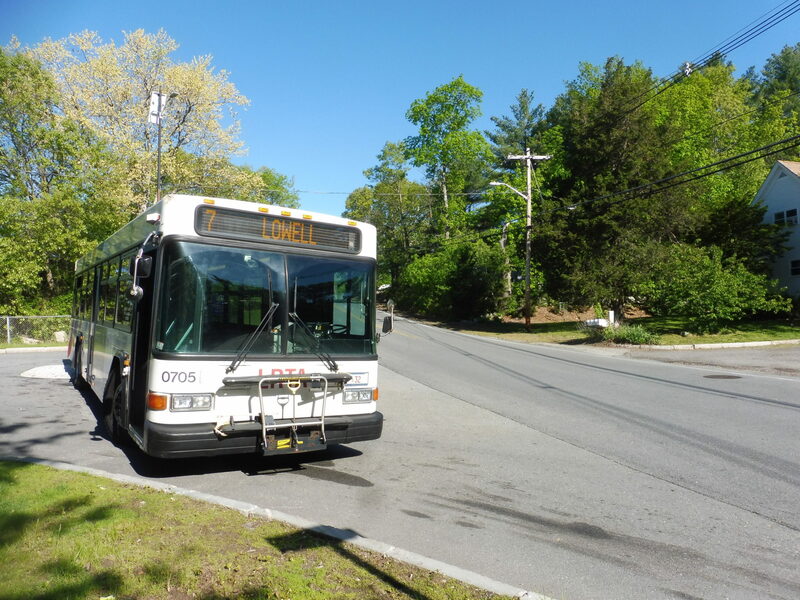 11, Gardner – Wachusett Commuter Shuttle: These schedules have been rearranged, I think possibly to provide better connections with each other. 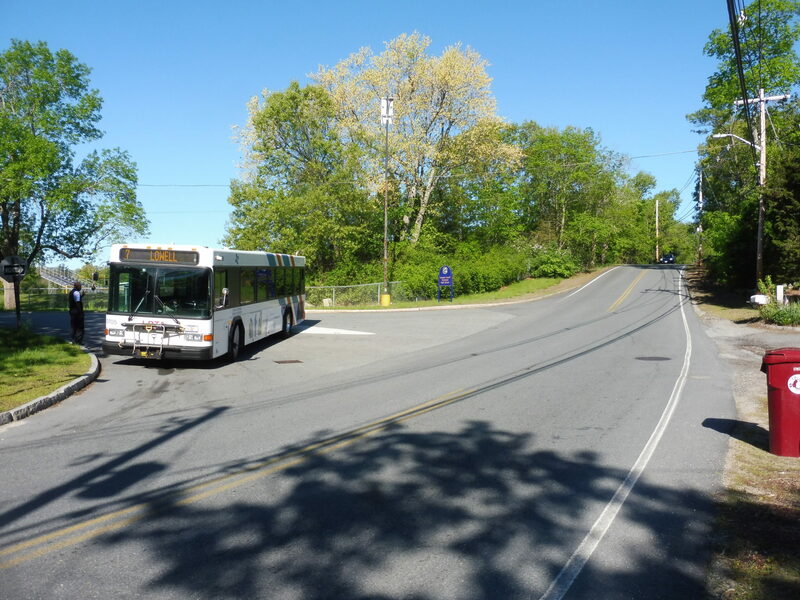 The number of trips on the 11 remains the same (with a better balance between the morning and evening now), while the Gardner – Wachusett Shuttle actually gained two trips, one in the morning and one in the afternoon. 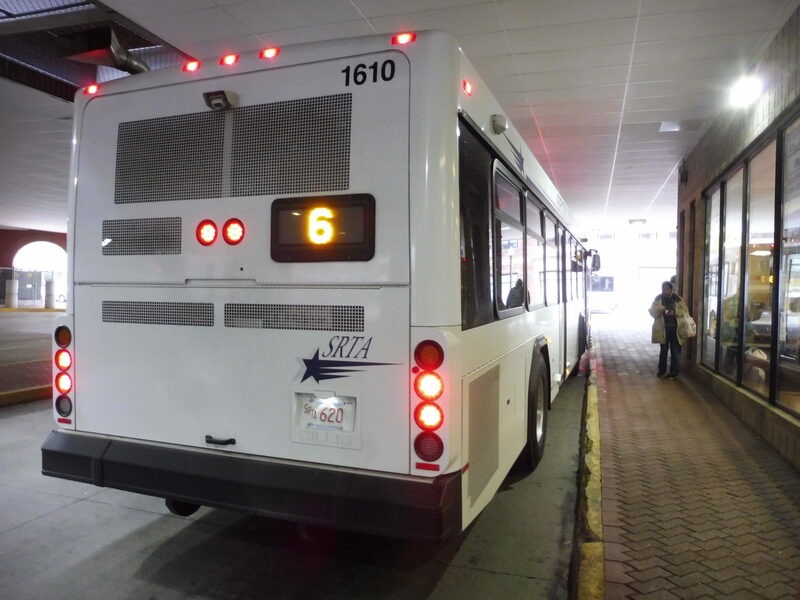 Gardner Routes: The 1’s last trip is now cut back to City Hall instead of the “ITC“. That’s it for Gardner. 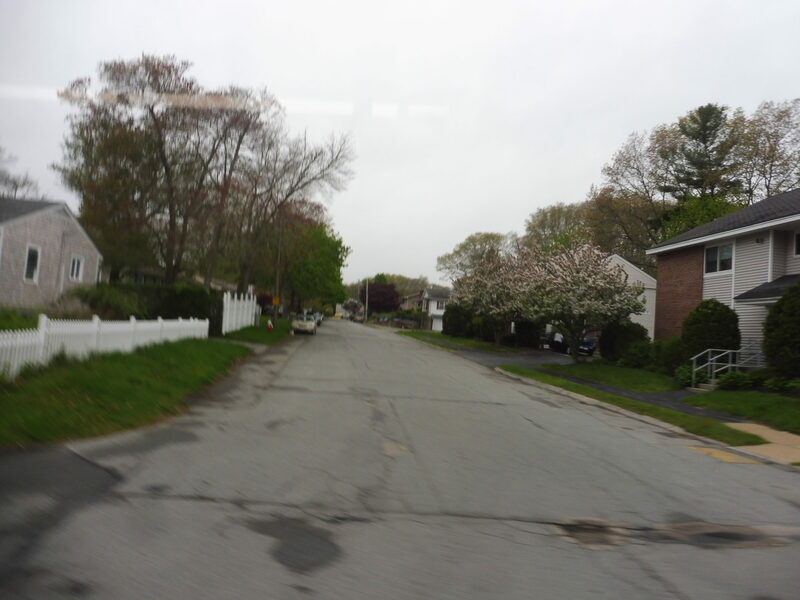 Athol/Orange Van Shuttle: This is an…odd change. You may remember that this route used to be a horrible messy loop with a million deviations. Now it only runs with one bus, but it’s been dramatically changed to be a linear journey between Athol and Orange! On the one hand, this is a lot more rational, and it can now run every hour instead of every 90 minutes like before. On the other hand, one look at the map is enough to tell you that they should really just extend the G-Link to Orange and use the resources of this bus to put better service on that one. They’re basically the same route at this point. They added a deviation to the 14…then they got rid of it “until further notice”. I don’t know. The PVTA made some big changes back in late summer, but the page announcing them can only be found on the WebArchive now. 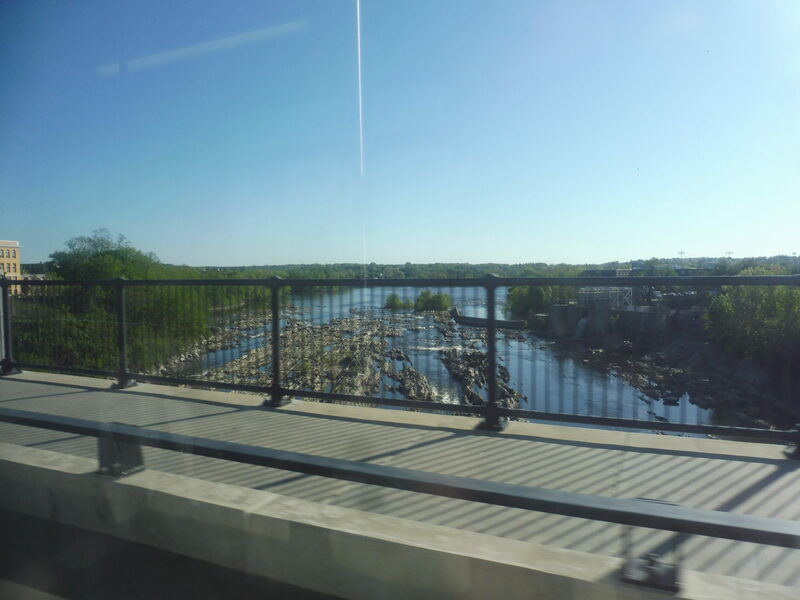 In short, they added a new downtown loop in Springfield; replaced all service to Wilbraham with a call-in service for residents only; added a new 39E route for seemingly no reason; reconfigured the former X98 for the 50th time; made the R24 even worse; totally rearranged the Palmer and Ware routes to the point where I might have to ride them again; and reconfigured a few other schedules. 3: Trips are getting padded out to improve on-time performance. This only affects arrival times in the outbound direction, but coming inbound, a lot of trips are leaving earlier than they usually do, so watch out for that. 9x: RIPTA doesn’t really give the full story here. They list a few trips that won’t be deviating to Citizens Bank, but in actuality, only one trip that served it before will be skipping it now. The new rule of thumb is that only reverse peak trips will serve the bank. Also, they’ve changed the times of two inbound trips without telling anyone – one will leave earlier and one will leave later. 10x: This once-daily route will be detouring due to construction. It looks like it’ll actually become more of an “x” route, spending some more time on the highway. Bear in mind that its trip times have changed slightly to reflect the new travel times. 50: An inbound school trip in the afternoon has been discontinued. 54: The 8:55 AM outbound trip on weekdays will no longer connect to the 87, not that they ever tell you which trips connect to begin with (get on that, RIPTA). Also, presumably coming from the 87, the former 1:07 PM weekday inbound trip will now depart from Main and High Streets across from Woonsocket City Hall (a different location than the regular starting point) at 1:09. Remember that, because the route’s schedule doesn’t actually tell you this information. It just shows the bus arriving at the next timepoint at 1:16 with a note that says “Trip starts from Main St. at the Municiple [sic] Parking Lot across from Woonsocket City Hall.” Nice, it doesn’t tell us the time, and it needs a round of spell check. 60: Two inbound trips in the afternoon, the 3:03 and 3:33 from Newport, will now depart ten minutes earlier. I’m not really sure why they did this – it creates some annoying scheduled bunches with the supplementary trips that deviate to NUWC, a naval base. 62/66: Trips are being shifted around and changed for better on-time performance, but the frequencies remain the same. 64: Apparently this change was made back in October: the 7:00 AM outbound trip was moved to 6:45. I don’t know why this is showing up on the winter schedule change page, but I’m putting it here anyway! QX: Oh darn it, of COURSE they had to add a new route! It’s better than some of the super infrequent housing-complex-to-Walmart routes they’ve been creating recently, but this thing still only has just two trips in each direction every day! Anyway, the QX is the Quonset Express, a route providing a much-needed express service to the Quonset Business Park. If they can advertise it well, I think this will be a really well-used route, since there are a ton of jobs in Quonset that aren’t served well by transit (the 14 kinda goes into it, but it’s not meant to get people to jobs). Until April 22nd, the route will be free to ride, so hopefully commuters will try taking a ride! Incidentally, this is why those route 20 short-turns to Elmwood Garage were added – this route runs in service to and from the garage for some reason. Nothing happening here. Which is good, because I talk about this darn system enough in my regular reviews! 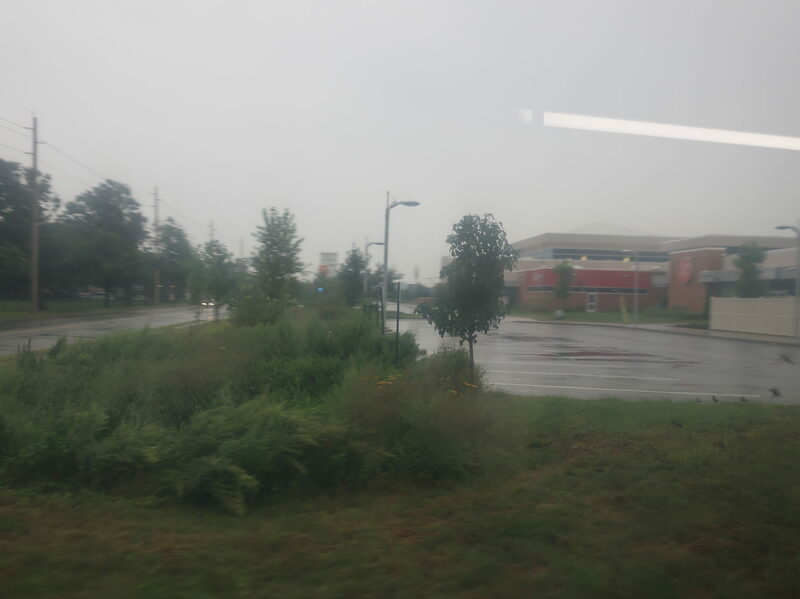 This system’s last service change was in September, when most notably they added a route 3A to the Ecotarium and North High School, and they moved the 5‘s terminus to a residential neighborhood rather than the near-abandoned Southwest Commons. However, they’re also doing some changes that will come into effect on January 26th. 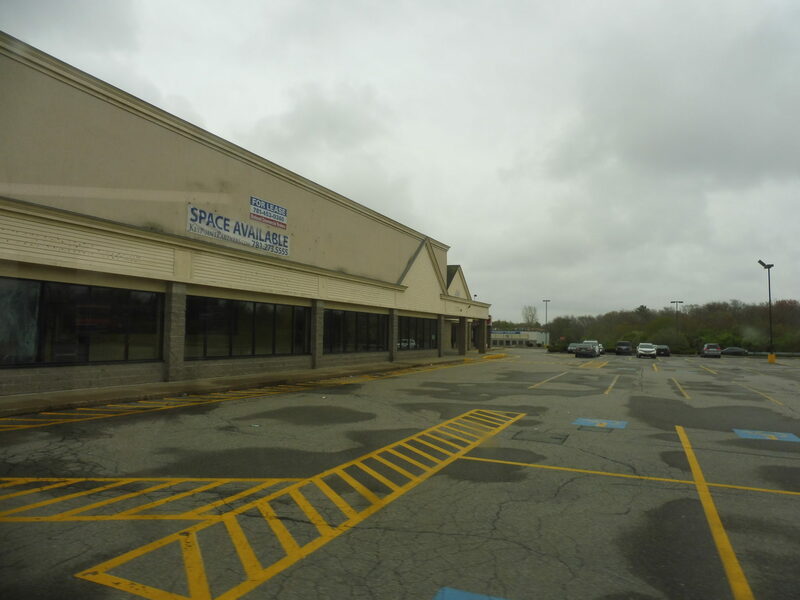 Firstly, they’re eliminating all but one of the 15‘s weird short-turns at Fairlawn Plaza. Why they kept one, I have no idea. The other changes involve new service spans: the 5 is shifting one hour earlier on weekdays; the 6 is gaining an hour at the beginning and end of its service day; the 25 is shifting one hour later on Sundays; and the 27 is shifting an hour earlier on Sundays (leading to overall more service hours at the Auburn Mall between it and the 25, I suppose), but also losing its last Saturday inbound trip. These are pretty neutral changes overall – the WRTA is capable of doing much worse. A lot has happened in 2018. 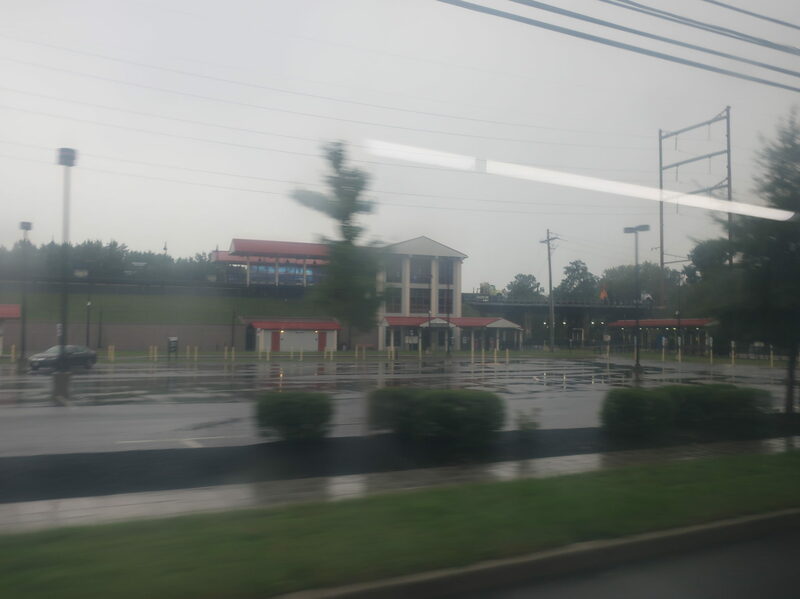 I’ve ridden the first trip of a new commuter rail line, conquered the bus from hell, and even changed domains and started writing about Philadelphia for some reason! As it stands, the vast majority of my viewership is still from Massachusetts (represent! 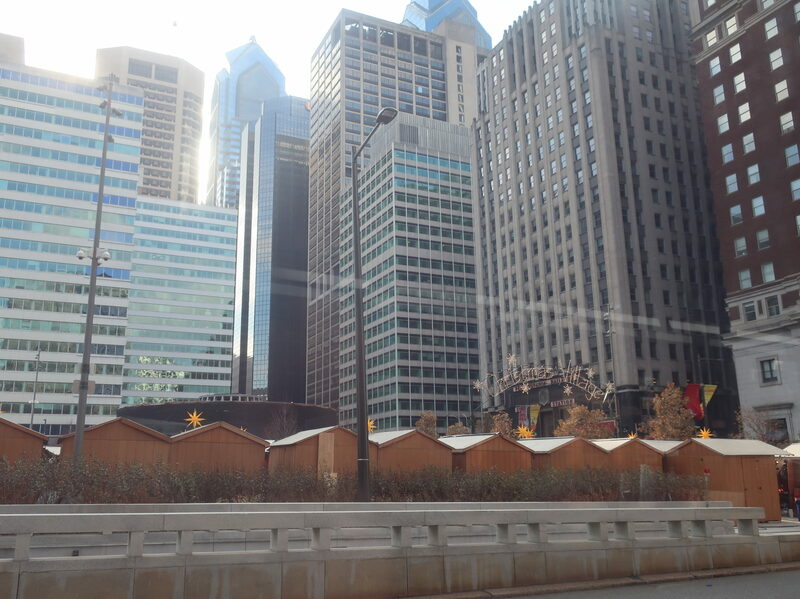 ), so hopefully the blog can stir up some interest in Philly this coming year. That doesn’t mean I’m done with New England, though – the backlog for Miles on the MBTA is intense, and as long as I’m still going back there for breaks, the jurisdiction will just keep on growing. Every bus route in Massachusetts? Sure! Every bus route in Rhode Island? Definitely! 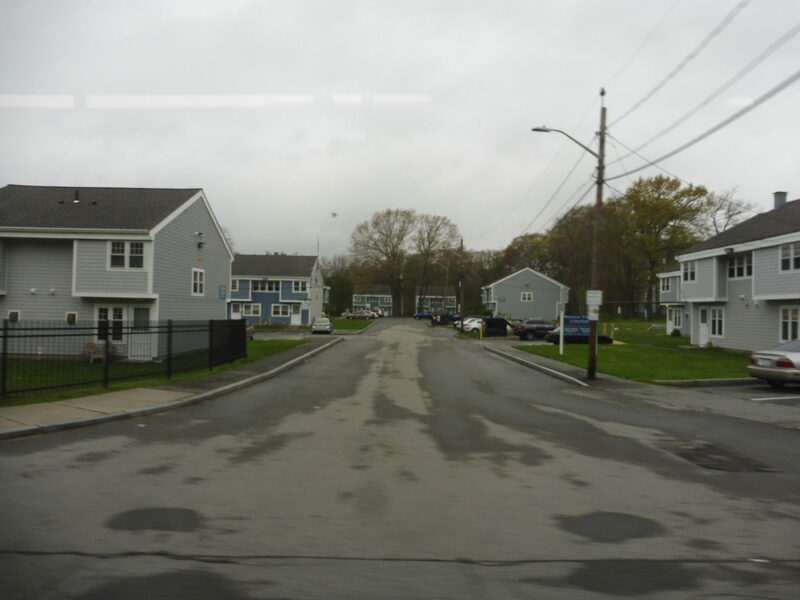 Every bus route in New England? You never know! So thank you all for sticking with me, whether you’ve been reading all six years or whether you’re one of my Penn friends reading the blog because I wouldn’t shut up about the fact that you should totally read the blog. Here’s to another amazing year…we’re gonna accomplish some fantastic things. We’re three routes away from finishing this darn system! 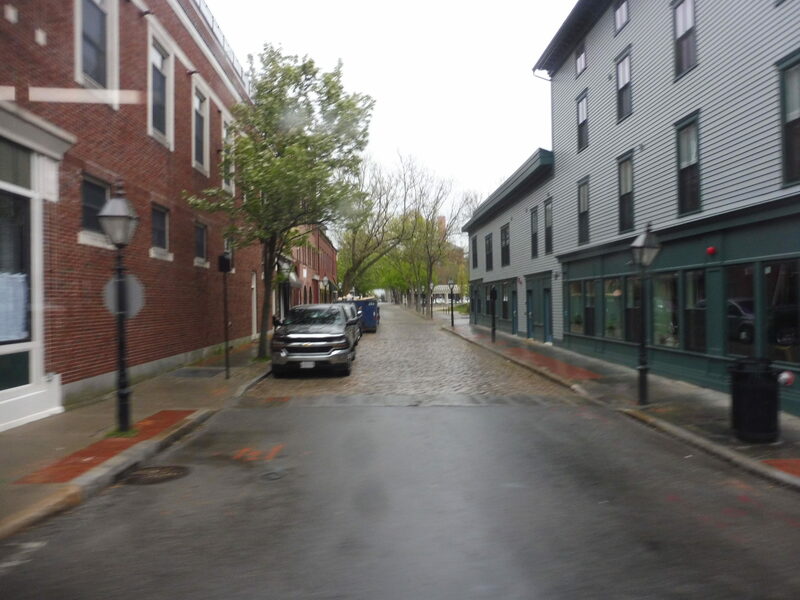 Fittingly, our third-to-last review will be the 3, a route that calls itself “Dartmouth Street” but takes a pretty significant deviation away from it when it gets into New Bedford. Now, I’m sorry to disappoint, but I did miss the route’s outbound-only deviation to Sol E Mar apartments. It basically makes a loop where it serves them on its way to Big Value Plaza, the shopping plaza in Dartmouth with nothing of note in it where the 3 officially starts. But while there’s a charming town center further south down the road, people aren’t gonna take the bus there, so we’re forced to start at this plaza named after a bargain store. Woo. 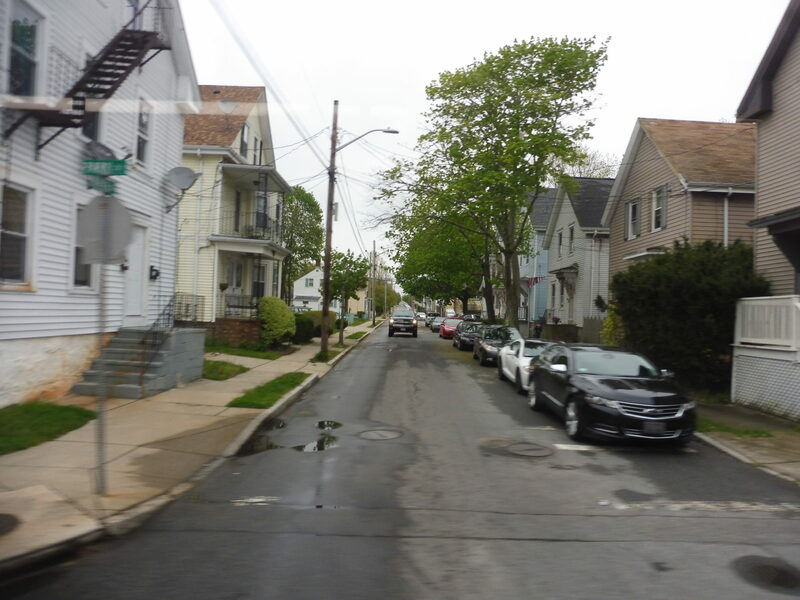 We headed up Dartmouth Street, a road mostly lined with sprawly suburban businesses, with houses on the side streets. Honestly, the entire Dartmouth section of the route was like that, until six minutes later when we entered New Bedford and deviated into a Stop & Shop (connecting to the 5 and 6). Continuing up Dartmouth Street from there, the neighborhood was a lot more mixed-use, with businesses occupying the ground floors of dense houses and apartments. The side streets were residential, meanwhile. 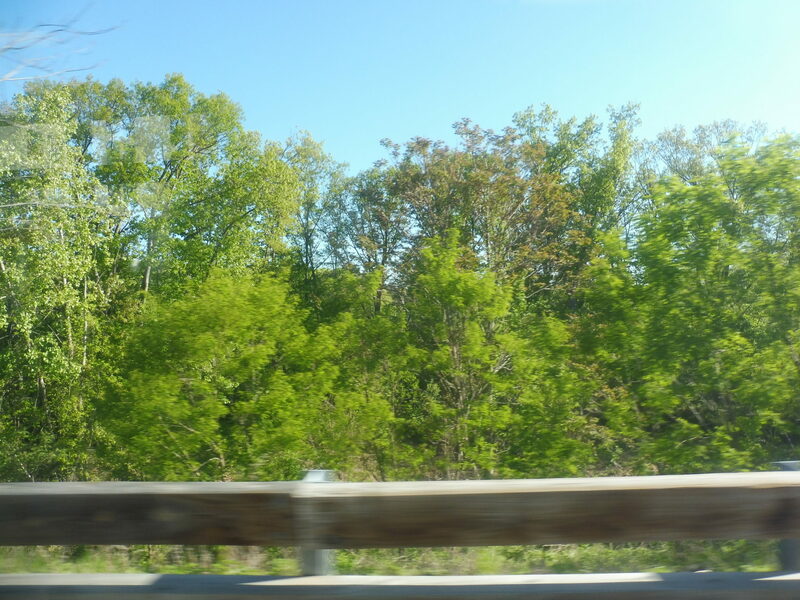 We passed a cemetery, and later on we made a sudden sharp turn onto Allen Street. We wouldn’t touch Dartmouth Street again for the rest of the route. Allen Street was all dense houses, and once we turned onto Page Street, it was clear why we were doing this deviation: it was to serve Saint Luke’s Hospital. Okay, that’s reasonable. What came after was annoying, though: left on Hawthorn Street, right on Rotch Street (which no bus should go down to begin with, since it’s just a local side street), right on Union Street. 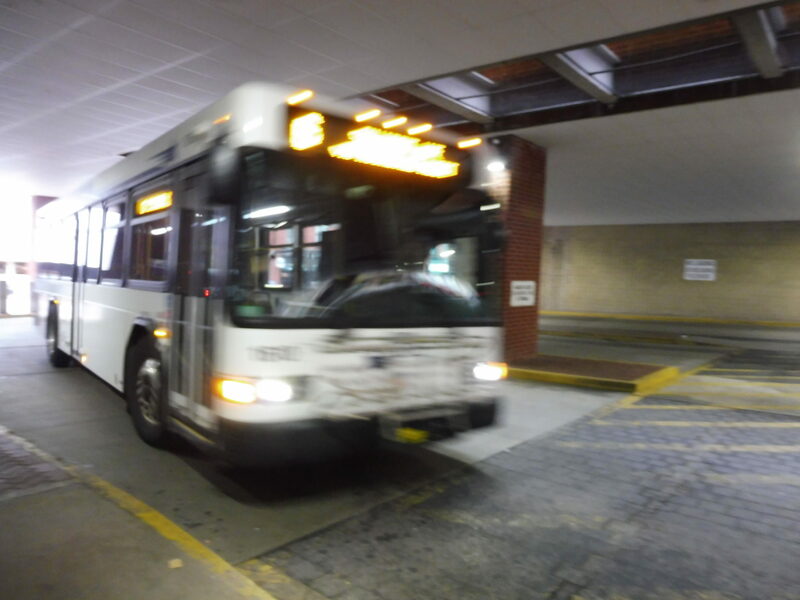 The street network does necessitate the jog, but it was a relief to take Union Street straight into downtown New Bedford, where we reached the bus terminal. And this whole section was just houses. Ridership: As far as New Bedford routes go, the 3’s ridership is pretty lame: about 312 riders per day. But also, the route has among the worst productivity on the New Bedford system, and we’ll see why soon. Pros: The route has great service on weekdays, running every half hour from 7 AM to past 9 PM. It also serves a lot, running down the main corridor of Dartmouth Street. The deviation to serve the hospital is annoying, but I get why the route does it. Cons: On Saturdays, it’s every hour from 8 to 5, which is…significantly worse than weekdays. But also, why does this route with mediocre ridership get one of the best service weekdays of any SRTA route? This is why its productivity is so bad! Maybe some of those resources could be put onto higher-performing routes than this one. That jog to the hospital also gets even more annoying after 6 PM on weekdays, when for some reason, it doesn’t use Rotch Street, instead jogging further out to Rockdale Ave! Maybe it’s because residents don’t want big buses clogging up their tiny street at night? I’m not sure, but it’s very odd. I see why it exists. I see why it does what it does. But that doesn’t make it any less unbearable to ride, and it doesn’t make the schedule any more logical. Oh well. I’m back in Philly! So far I’ve taken the El and a few buses, but I’ve yet to set foot on the ol’ Broad Street Line. Will that hinder my ability to properly review Tasker-Morris Station in South Philadelphia? Uhhh…doesn’t matter, because there’s no turning back – I gotta get through my backlog! Really easy to miss, huh? There are four entrances to Tasker-Morris, two at Tasker Street and two at Morris Street. All of them are…discrete, to say the least. I mean, the staircases are really tucked away next to buildings. This is more or less the standard for South Philly, but that doesn’t mean I’m a fan. Also, there are no elevators, which means that this is one of the many Broad Street Line stations that’s not wheelchair accessible. Welcome to the Hall of Mirrors! 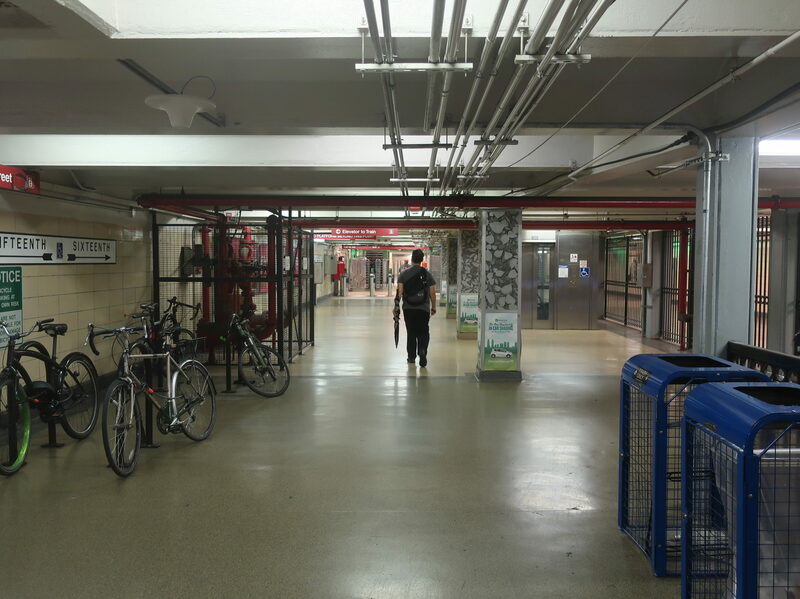 The two Morris Street entrances can only be accessed by walking down these long, twisty hallways. They both have strange mirrors on the corners that are used to…peek around, I guess? Also, one of the hallways requires passengers to go a few steps down to access, even though it’s taking them above ground. That’s just annoying! A SEPTA mezzanine that’s way bigger than it should be? SHOCKING. As usual, the mezzanine for this station is just a giant place with way too much space for its own good. I mean, look at how much room there is here! There’s really no excuse to only have three fare gates and two fare machines. SEPTA, you have to use your space better than this! 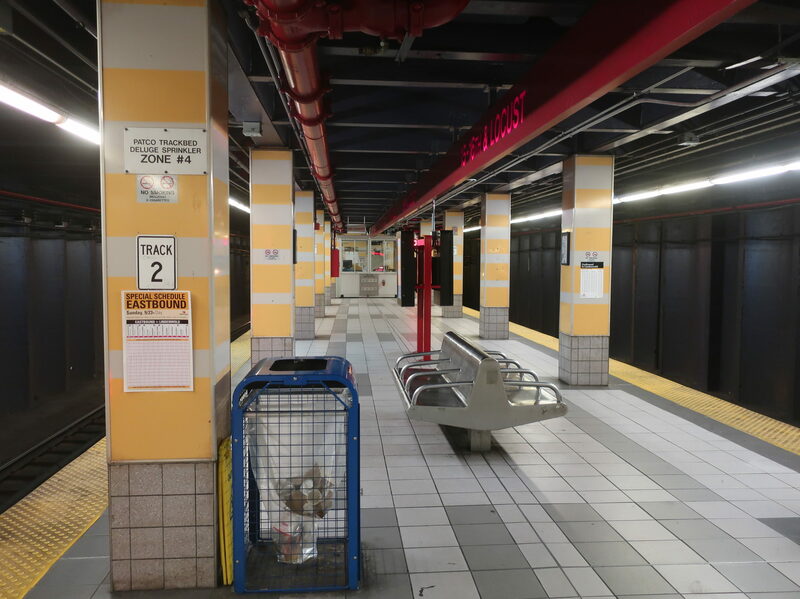 Why not put in some new fare gates closer to the exits, since at the moment, you have to walk down to the center of the mezzanine to enter the station? They would be unstaffed, but ideally the cashier would have a security camera view of each one to potentially catch fare dodgers. Another classic SEPTA element of Tasker-Morris is the waiting area just beyond the fare gates. It has a few benches within sight of the cashier, as well as some maps and wastebaskets. Multiple staircases lead from here down to the platform, while the signage directing passengers towards exits and buses is pretty good. There isn’t much to say about the platform, since it’s what you would expect. 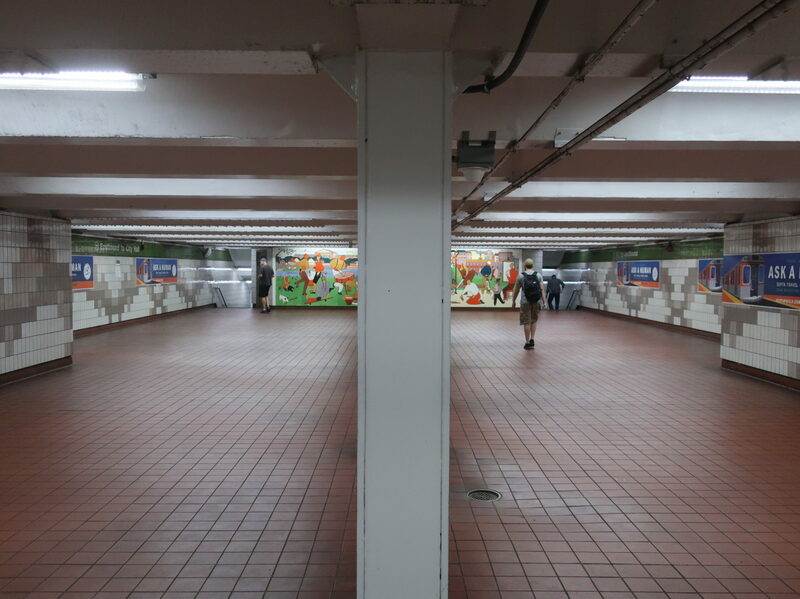 It’s a center platform with benches and wastebaskets all along it, and that’s about all there is to it. Everything is as aesthetically meh as you would expect from a Broad Street Line station. Someone waits for the 29. Oh right, we have to talk about the bus connections. I gotta say, the bus stops here make a lot of sense. 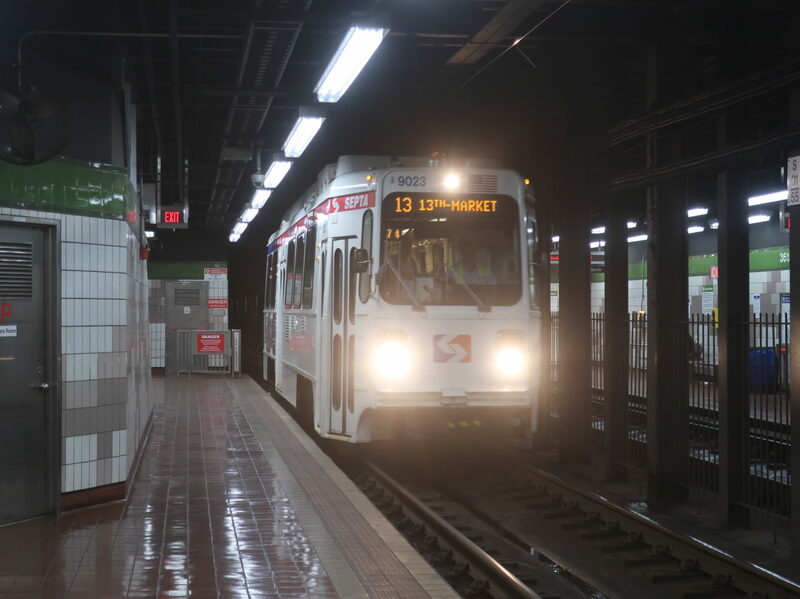 The 4, which runs straight up Broad Street, essentially has four stops here, two each at Tasker and Morris – all but one of them are signs, which is really all the 4 needs. The 29, meanwhile, is the crosstown route along Tasker and Morris Streets. Even though both of those are tiny one-ways, the route gets shelters at both of its stops here! Granted, neither of them have benches underneath, but it’s a start. I think those AT&T headsigns on the trains are more or less gone now. 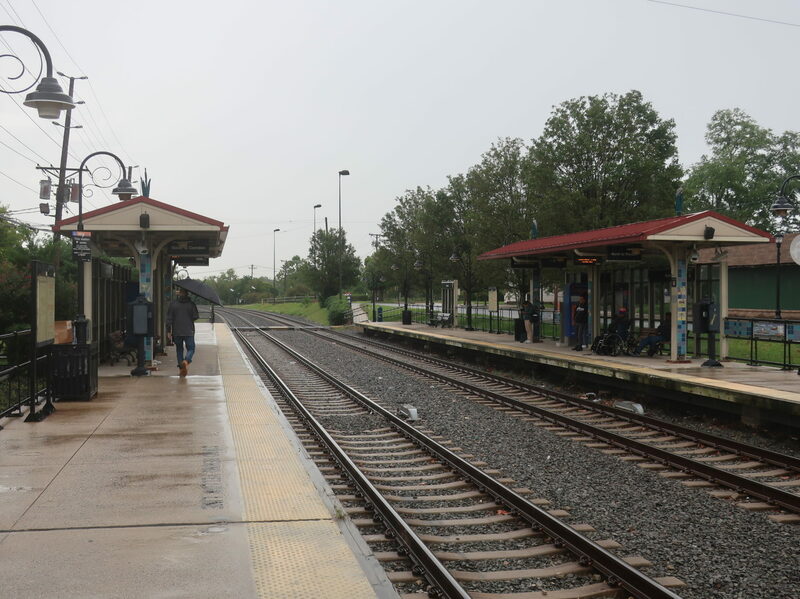 Ridership: Tasker-Morris is the second-busiest station in South Philly, getting just over 5,000 riders every weekday. Most of that ridership is coming from the dense apartments all around the station, although nearby East Passyunk Ave is probably a draw, too. Pros: This station has perhaps the most sensible bus infrastructure I’ve seen so far at a SEPTA stop (not including the big transportation centers)! Other than that, it’s in an excellent location, which lends itself to high ridership. Cons: Even though we finally get bike ramps on the stairs, they’re hardly functional because of the gap in the middle! If you’re gonna have to lug your bike off of one ramp around onto the next one, you might as well just carry it all the way down the stairs. The mezzanine is a terrible use of space, as usual, and the station entrances are underwhelming. Finally, it’s not wheelchair accessible. 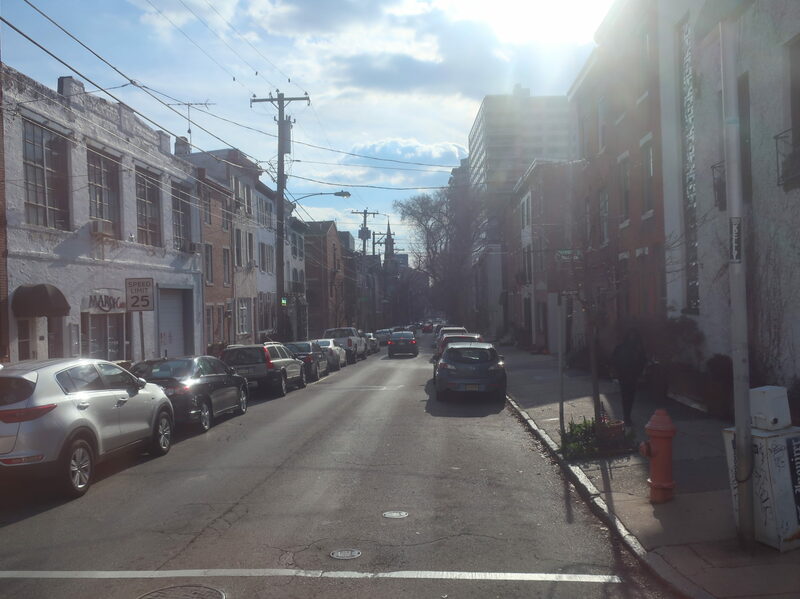 Nearby and Noteworthy: I love my East Passyunk Ave. This is the closest stop to many of the attractions along that thoroughfare. Also, I missed it this year, but the Miracle on South 13th Street is a tradition where all the houses on 13th between Tasker and Morris go all-out with Christmas decorations. It looks like a ton of fun, and I hope to make it down there next year. Yeah, I’d say this is of similar quality to Snyder. Tasker-Morris is a touch better than Snyder, but with all its problems, I can’t see it getting higher than a 5. This is just a generic, uninteresting Broad Street Line station, although it is close to a bunch of great stores and restaurants. Also, there’s a punk song about it, so…that’s neat? The NB 8 is the same bus as the North End Shuttle, with every run on this route turning into a loop on that one before coming back. I really wish they made it more obvious that they use the same bus, but marketing them as two different routes does have one advantage: it makes the 8 look a whole lot better on its own. Ah…good place to start a bus route. I just stayed on the North End Shuttle, so after deviating to Fieldstone Marketplace (which has nothing of substance in it), we took Kings Highway over Route 140 and turned onto Mount Pleasant Street. 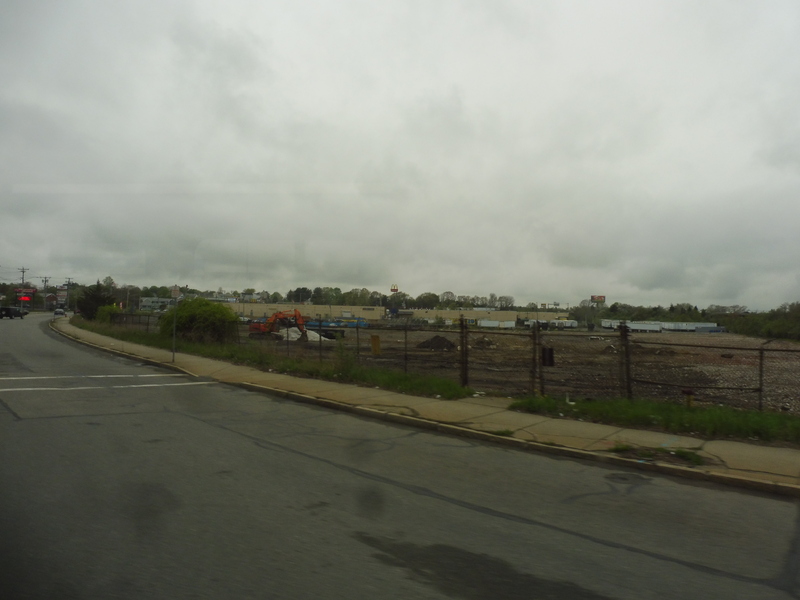 Although there were a few houses and a cemetery along here, it was mostly industrial. We crossed Route 140 again and there was some public housing on the other side, although we missed out on a Price Rite supermarket and a bunch of apartments a few blocks away. That McDonald’s sign is where the Price Rite is. So, not an insignificant distance. Mount Pleasant Street still did run through some dense housing. We also went by another cemetery and an elementary school. It was all residential as we crossed I-195, and it remained so on the other side, apart from a few convenience stores here and there. 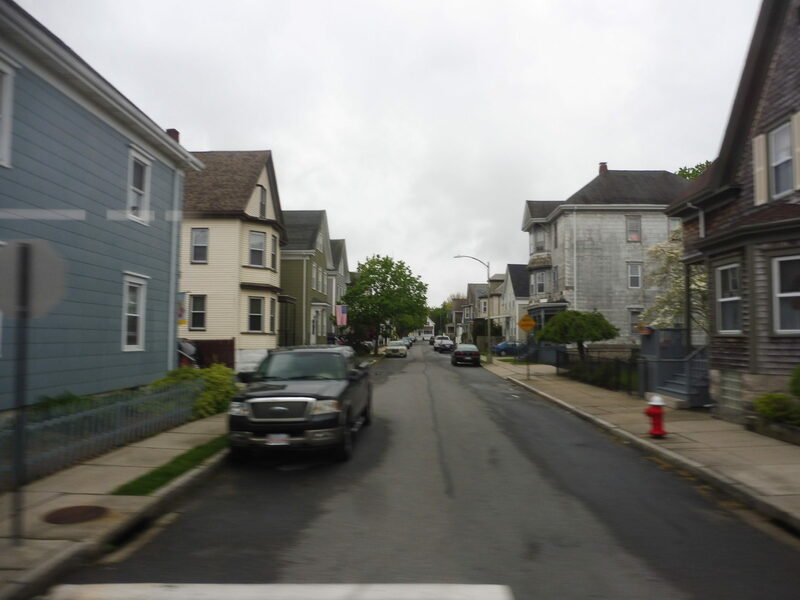 Eventually, we turned onto Kempton Street, and this led us into downtown New Bedford. After taking a right on 6th Street, we had arrived at the terminal. The bus changed routes when we got to New Bedford, so you know what? Here’s a picture of the FR 8. You can’t tell the difference! Ridership: This one gets a respectable-for-SRTA-standards 340 passengers per day. My trip got 9 people, which was one of the highest I had seen all day. Pros: It’s a nice straight shot serving a lot of dense houses and apartments on its southern half, plus it gets decent ridership. Cons: Despite getting a decent amount of passengers, the 8 has a pretty awful schedule. 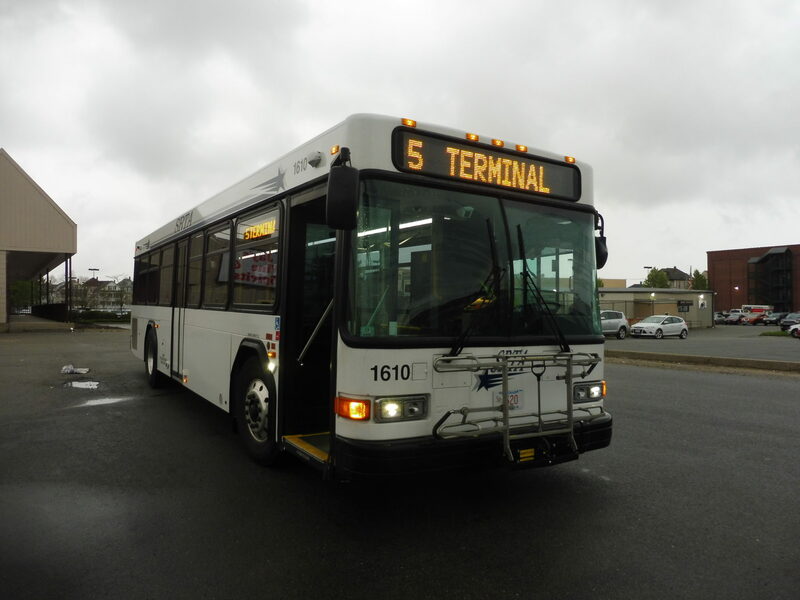 Service only operates from 7 AM to 6 PM (8 to 5 on Saturdays), and it’s every 40 minutes throughout the day. The NB 3 gets fewer people than this, but that one runs every half hour until 9 PM! Also, I can’t believe I’m saying this, but a jog or deviation to Price Rite might be a good idea. It’s an 8-minute walk from the route at present – serving a supermarket would probably add a lot of ridership, especially with the route’s midday-focused schedule. It would also provide access to a giant apartment development. Nearby and Noteworthy: It’s mostly residential, apart from the plazas at the end, which don’t have much in them. It doesn’t seem like the 8 is especially useful at the moment. Its schedule doesn’t match its ridership, and it doesn’t really serve much once it leaves the urban core. 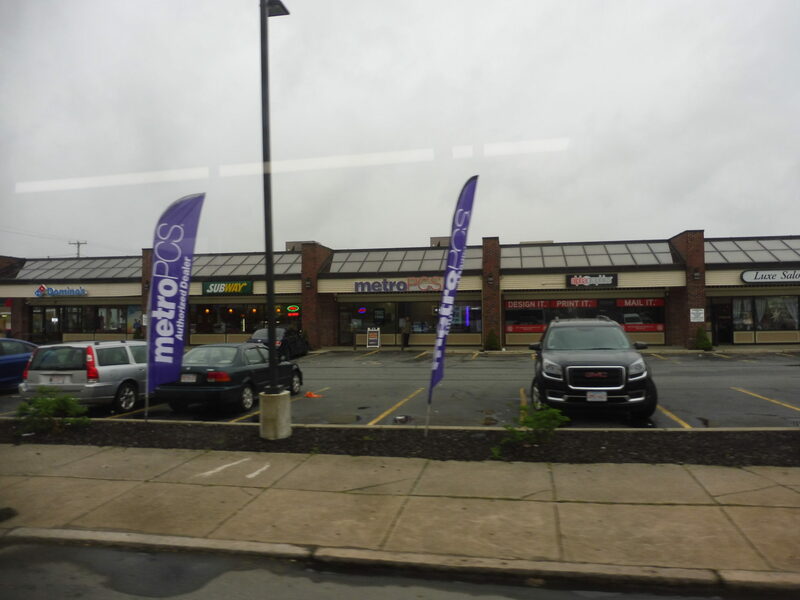 As it stands, for passengers to get food, they have to stay on when the bus becomes the North End Shuttle and use the Stop & Shop deviation, but that’s only in one direction. Of course, SRTA also doesn’t tell you the two routes interline, so that connection might as well not exist for an unfamiliar riders!